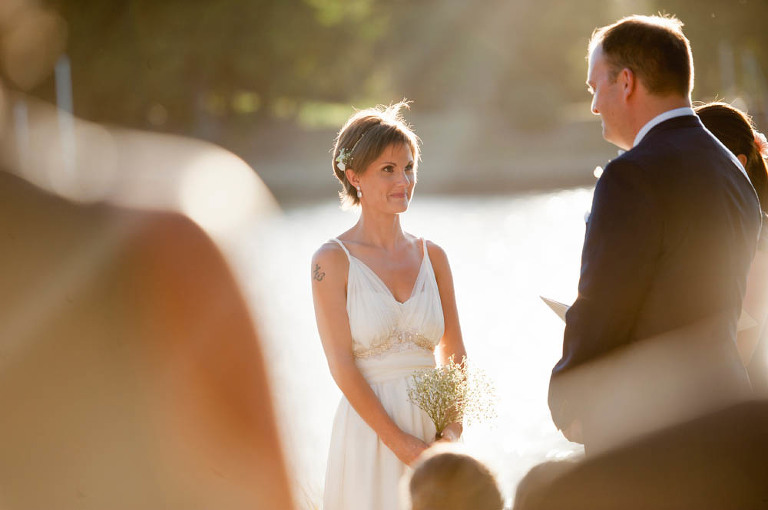 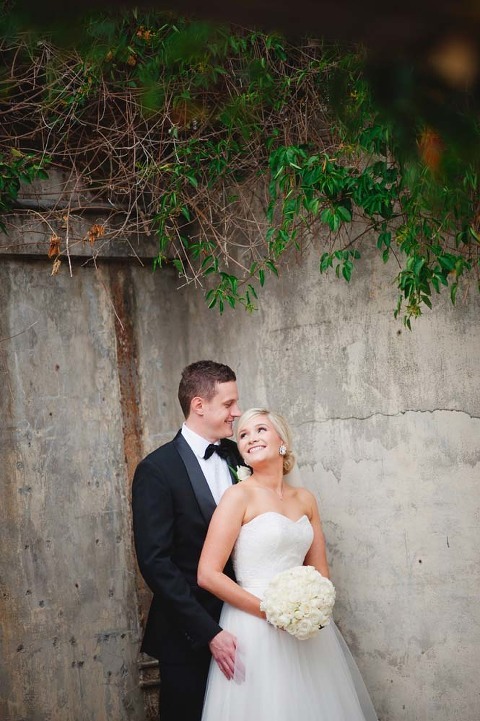 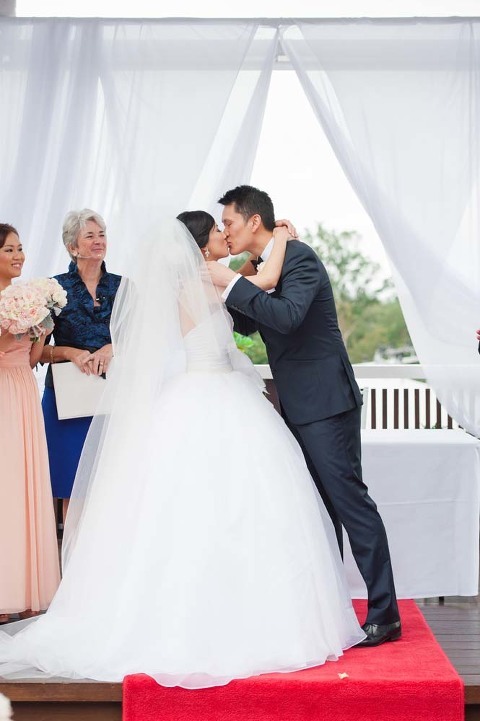 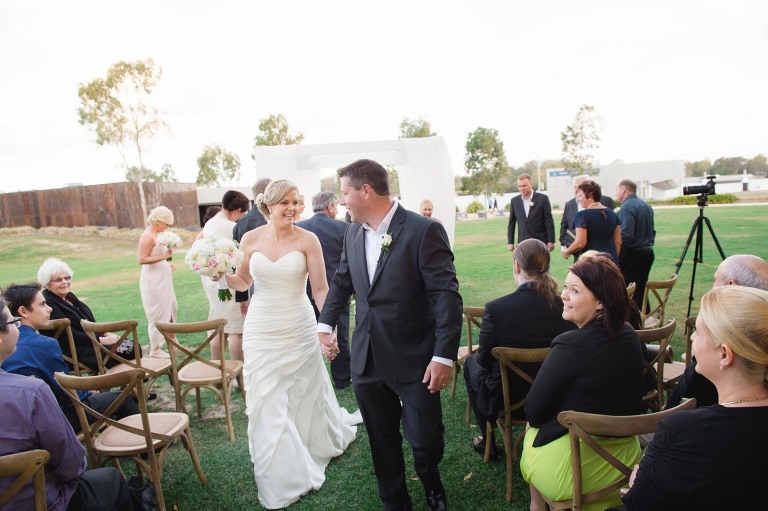 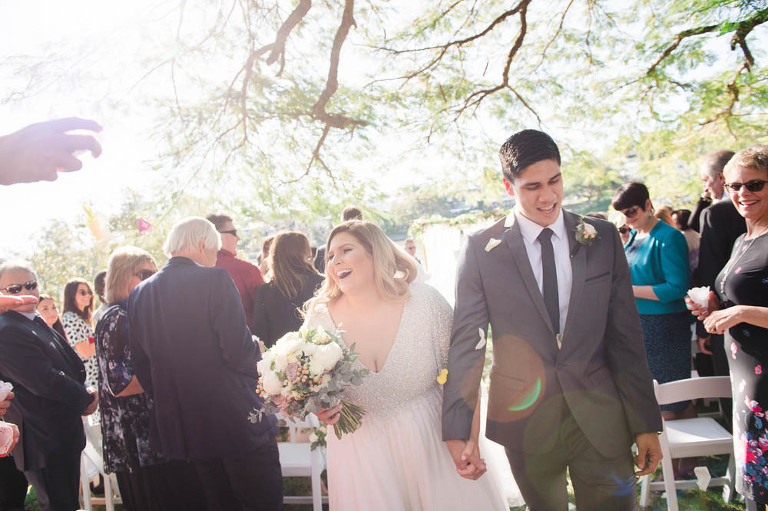 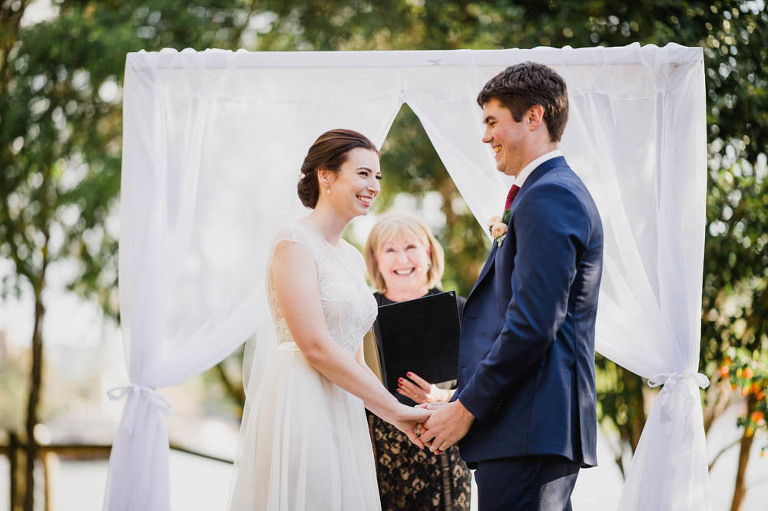 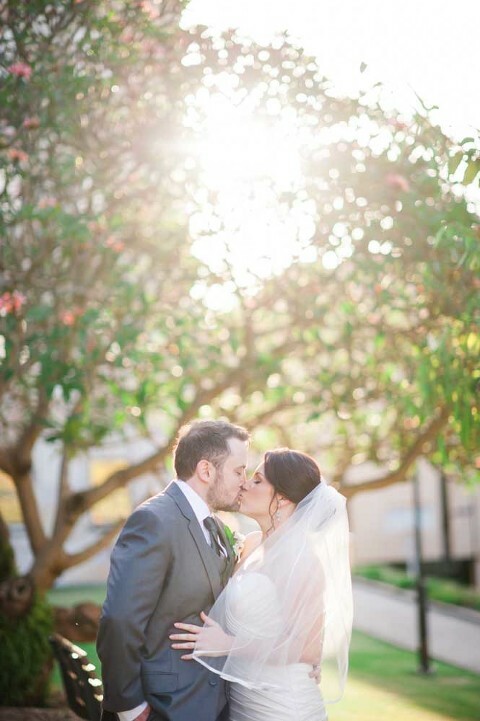 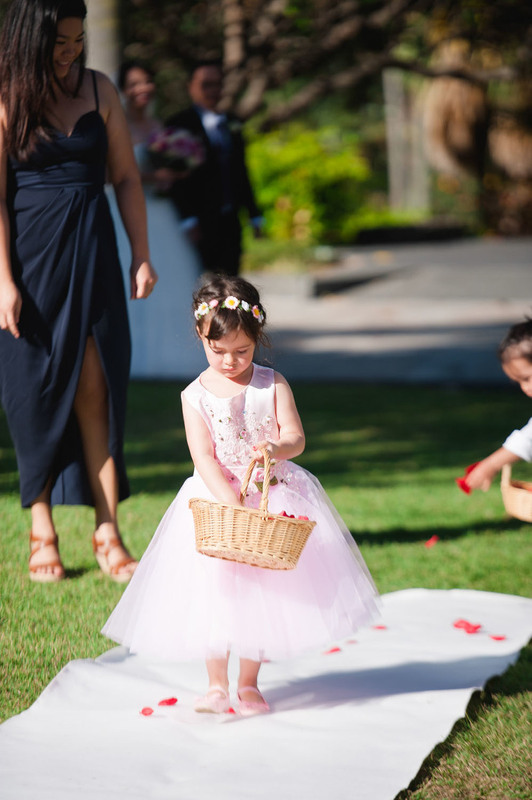 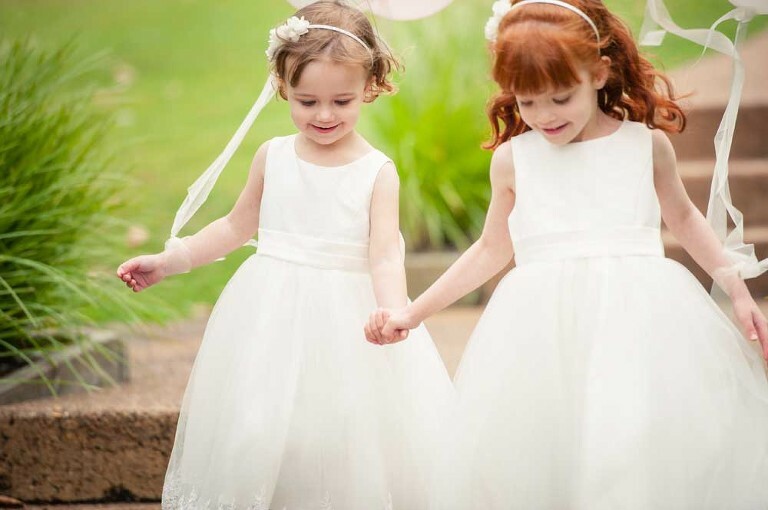 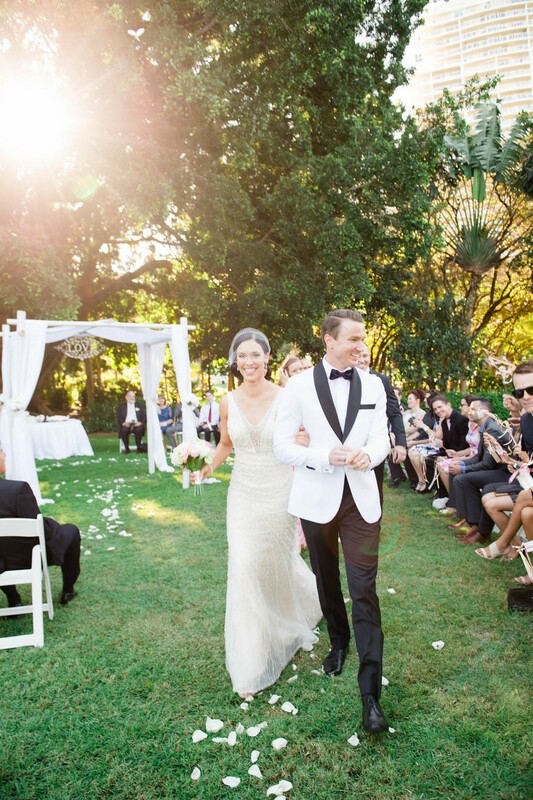 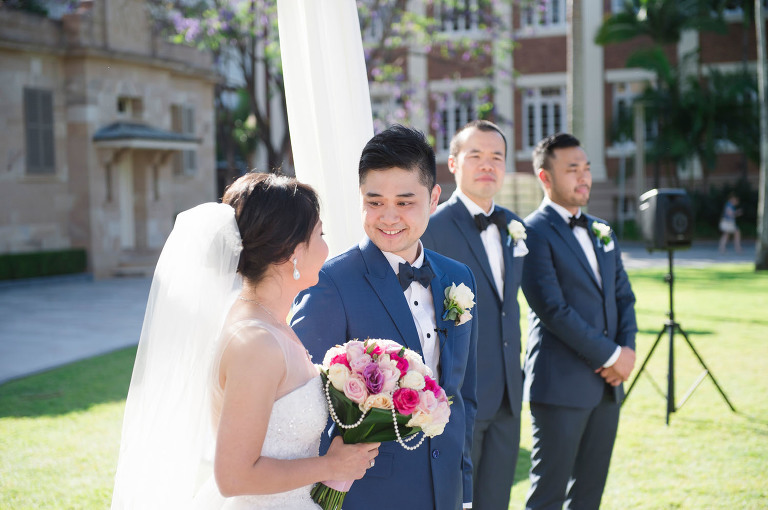 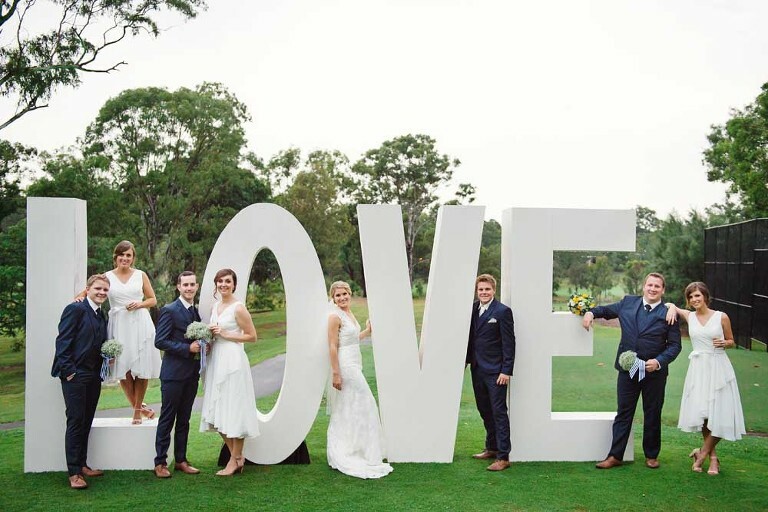 Brisbane is blessed with awesome weather throughout much of the year, so outdoor ceremonies are a popular choice. 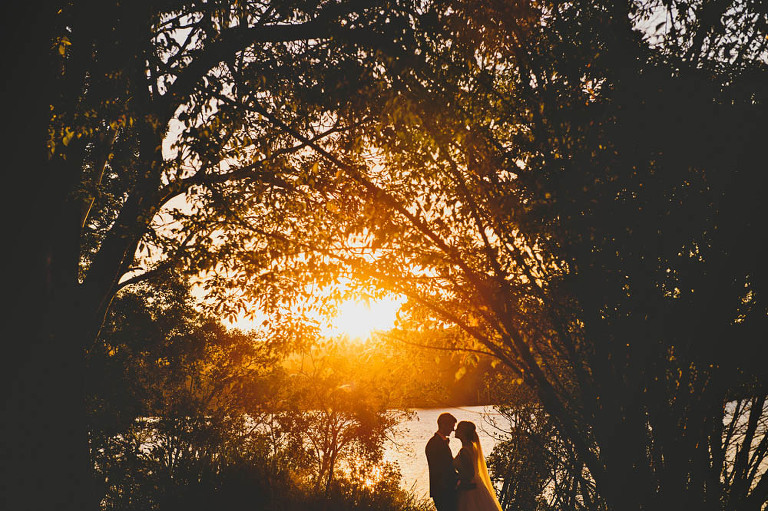 I have compiled a list below of ceremony locations that I love and hope to give you a wedding photographer's perspective on them. 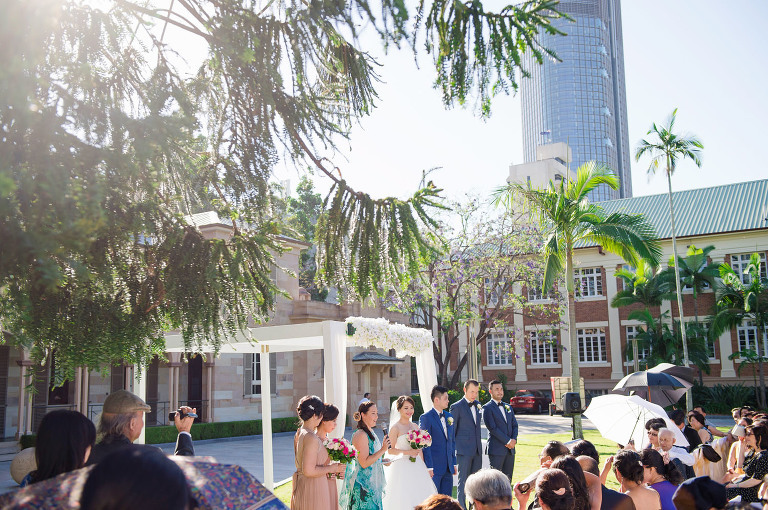 The City Botanic Gardens in Brisbane’s CBD is it’s own little green oasis amidst the hustle and bustle of the city centre. 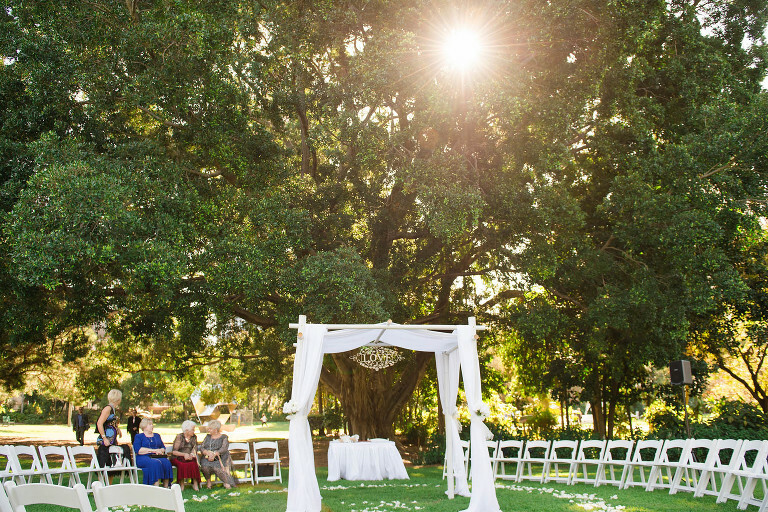 The manicured lawns and majestic trees provide the perfect backdrop for a great outdoor garden wedding ceremony. 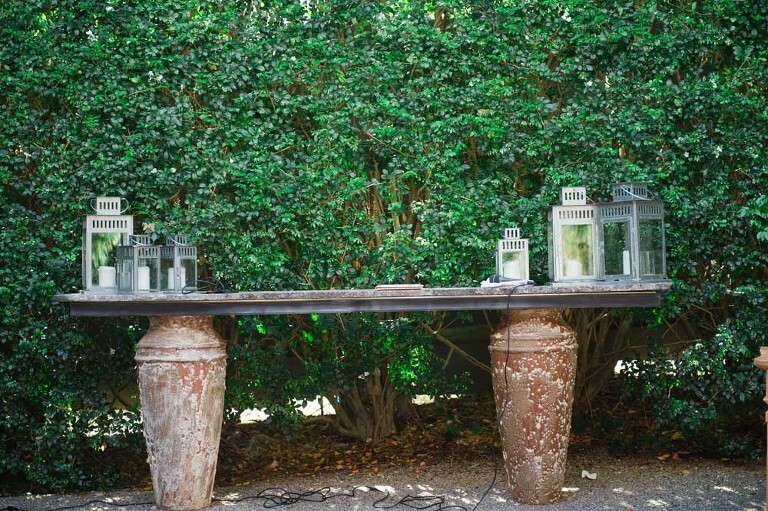 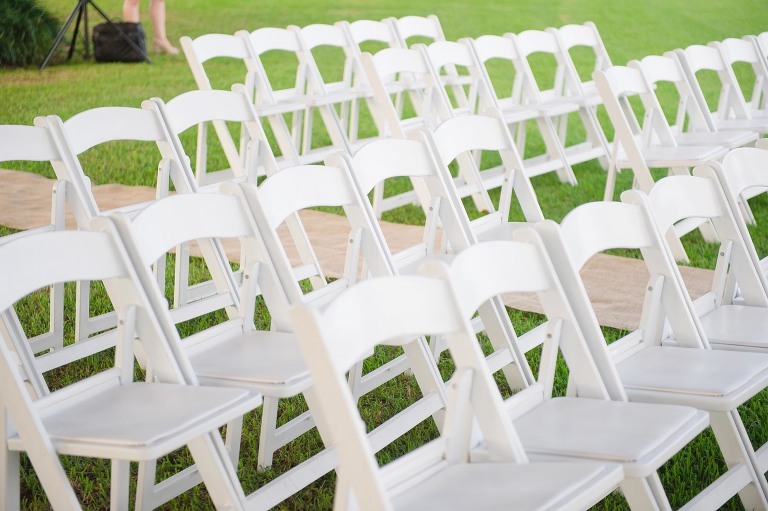 There are 10 outdoor designated areas that can be reserved for weddings. 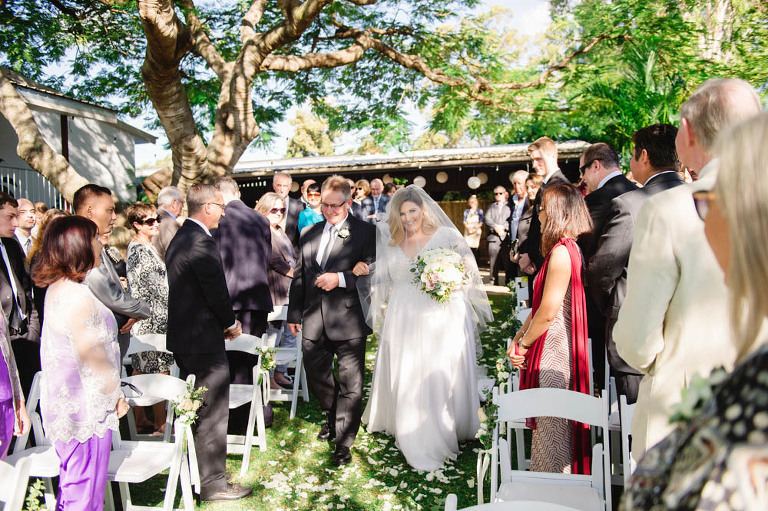 The choice of areas range from an intimate avenue of hundred year old Fig Trees, large open lawn areas and there is even an area beside a waterfall and sub tropical gardens. 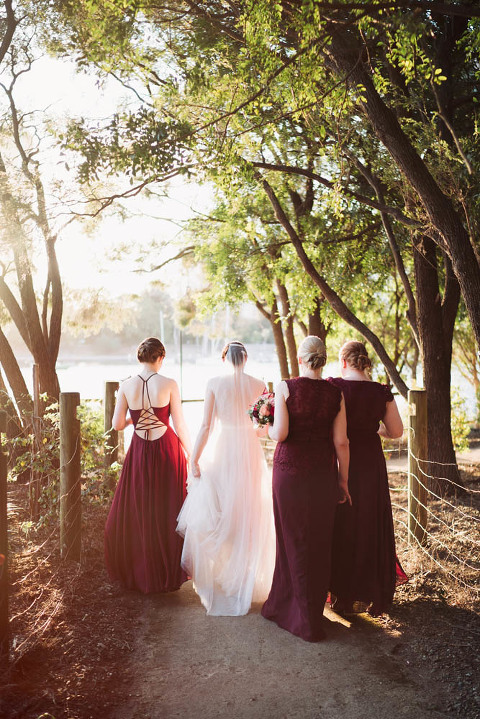 Once the ceremony is complete and the family photos are done there are some amazing places throughout the park for location portraits with the bridal party. 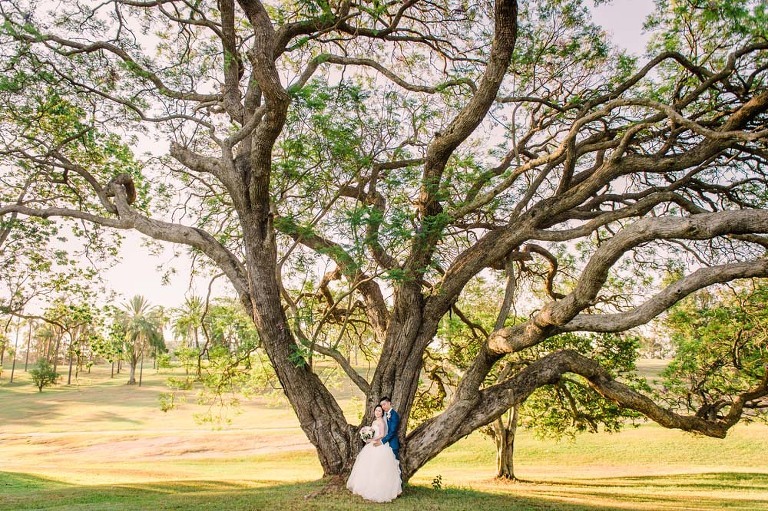 Gorgeous old trees, colourful gardens, in season blooming trees such as jacarandas, mangrove boardwalks and tons of other hidden, out of the way, secret locations that I love to take my couples to. 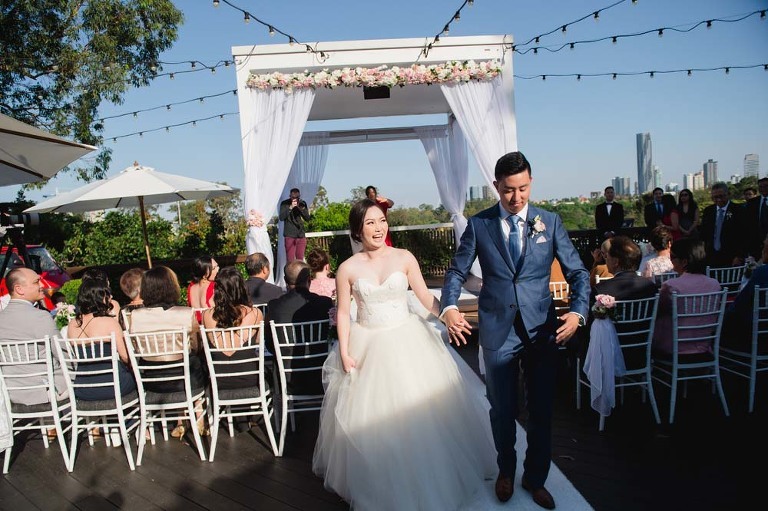 The nearby river also provides some amazing opportunities for photography with stunning views of the city and the iconic Story Bridge. 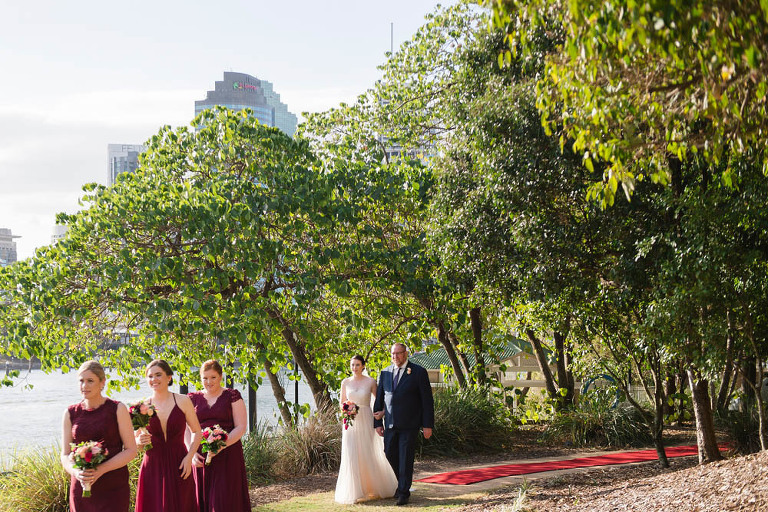 The Brisbane city Botanic gardens also has the unique advantage in that it is amazingly close to the best restaurants and wedding reception venues in the city too. 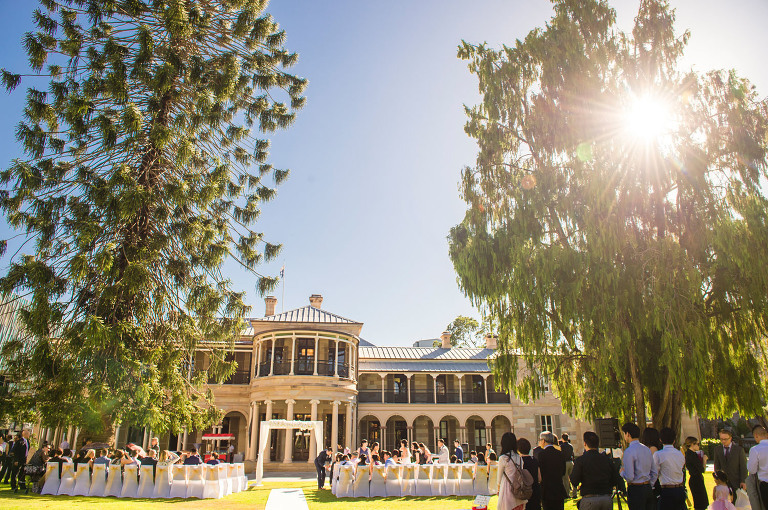 If you are after a stately / old world feel to your outdoor wedding, I can highly recommend having your ceremony on the grounds of Old Government House. 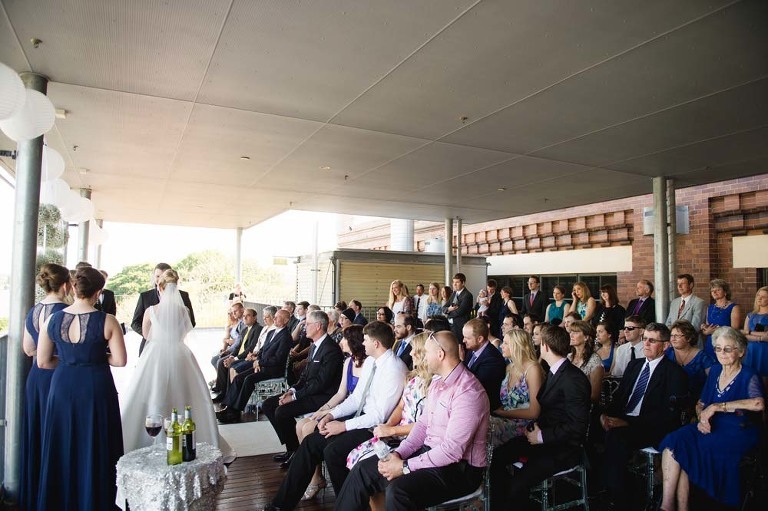 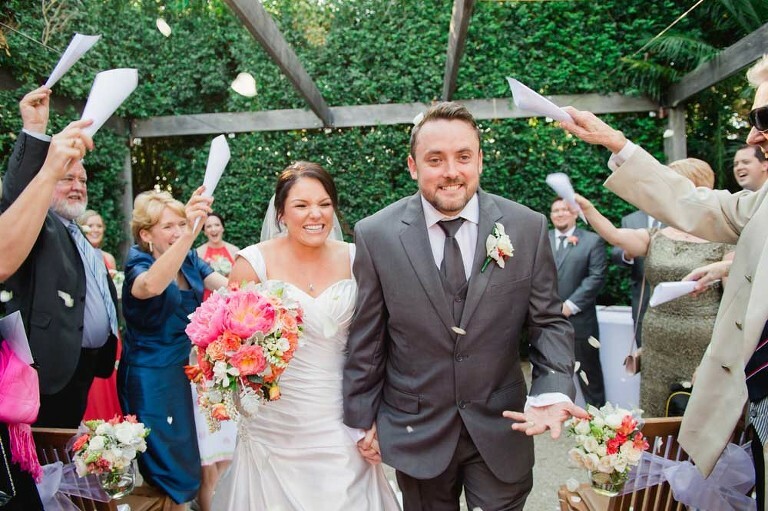 Options for ceremonies include indoors by the staircase and also their walled inner courtyard. 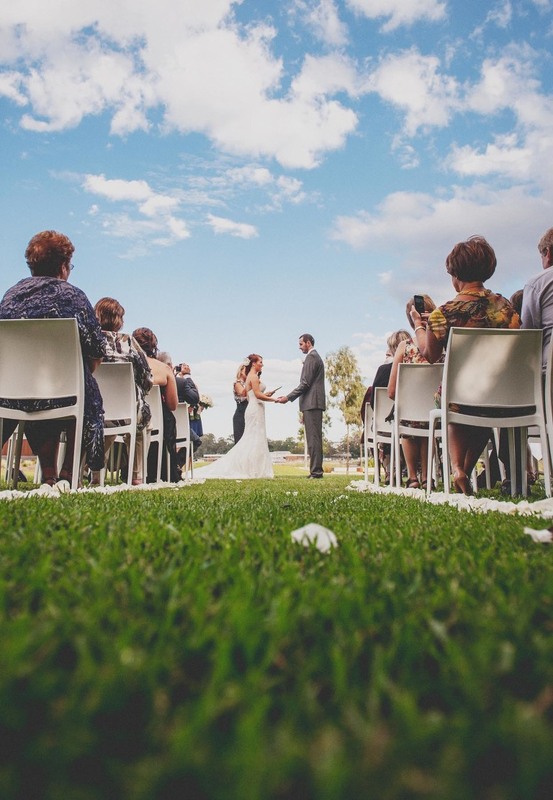 But perhaps the most popular ceremony option is the Kidney lawn just outside. 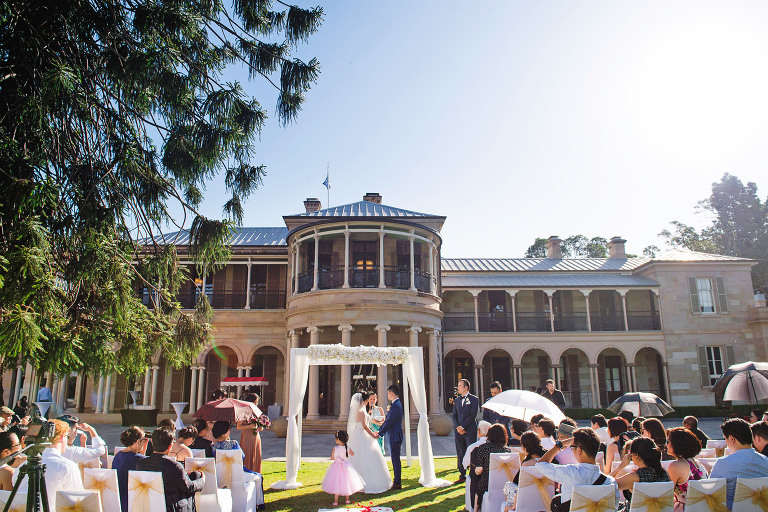 This sunlit lawn has the magnificent old building as the backdrop to your wedding. 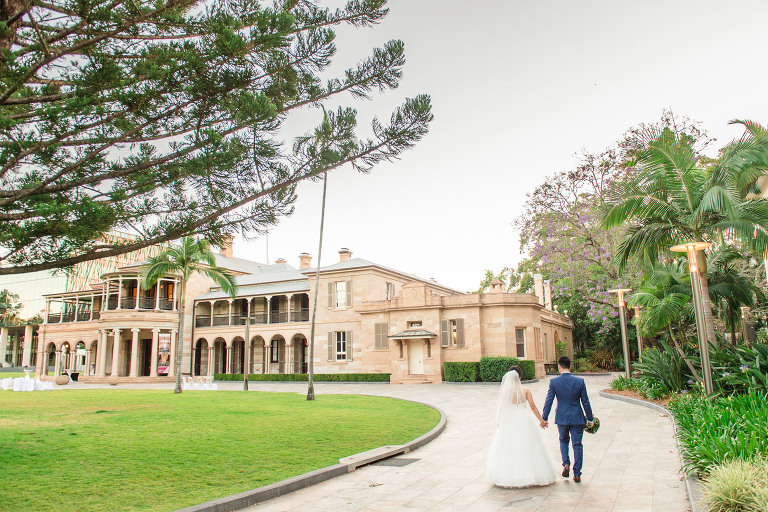 Post ceremony, the colonial architecture and sandstone columns can provide that classic touch to your wedding photography. 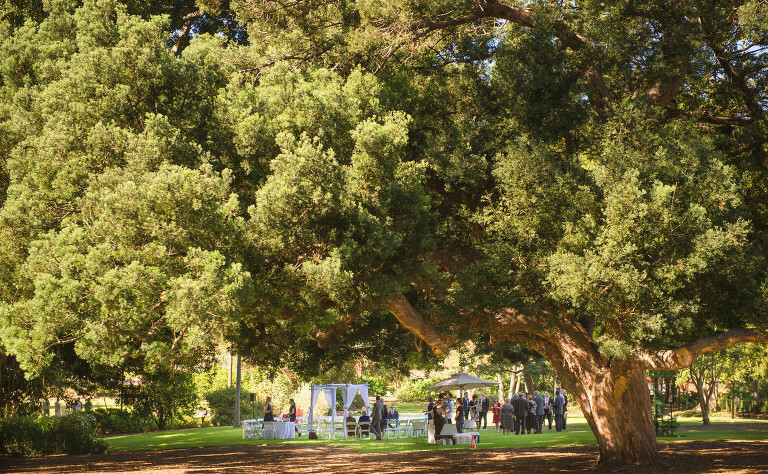 And the city botanic gardens are also right next door! 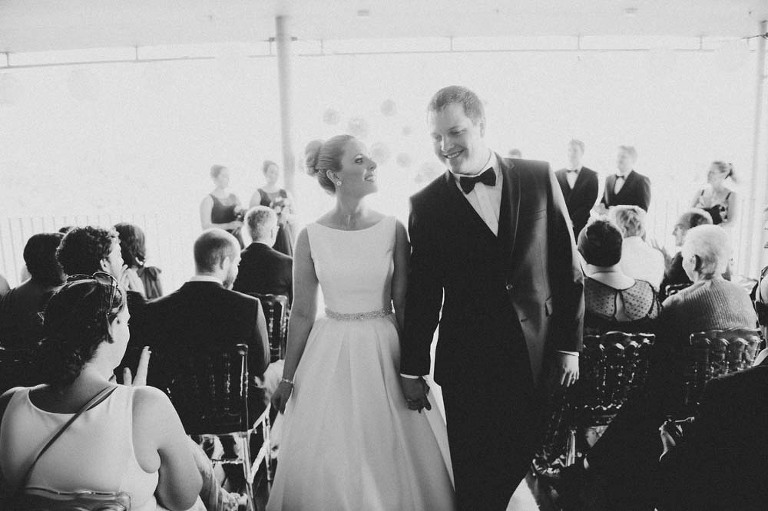 The nearby Room Three Sixty is also a highly recommended venue to host your reception. 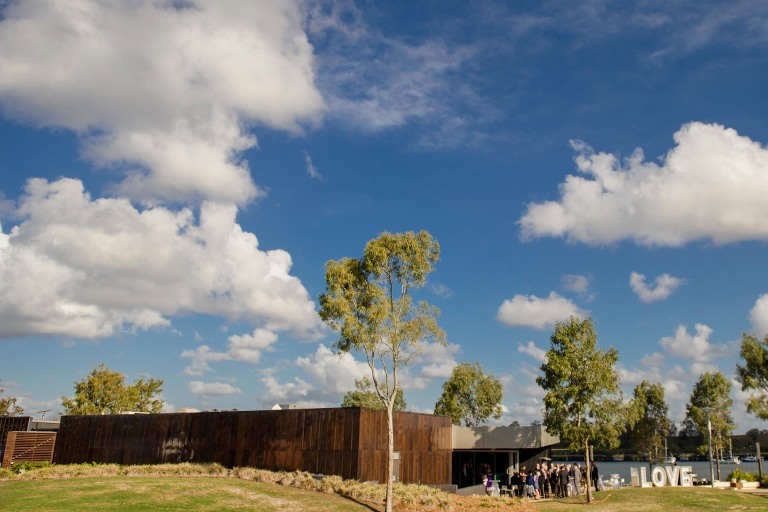 Northshore Harbour is set in the new and upcoming Hamilton Reach precinct. 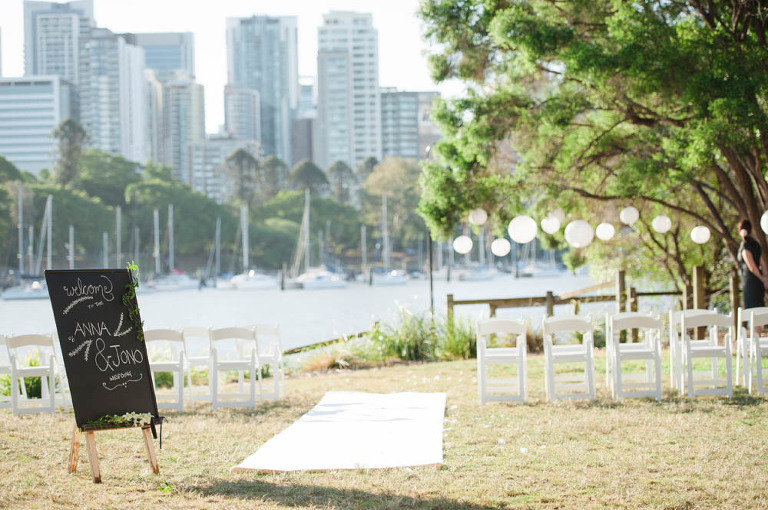 Situated east of the Brisbane CBD, Northshore is a park with a quiet and laid back riverside feel. 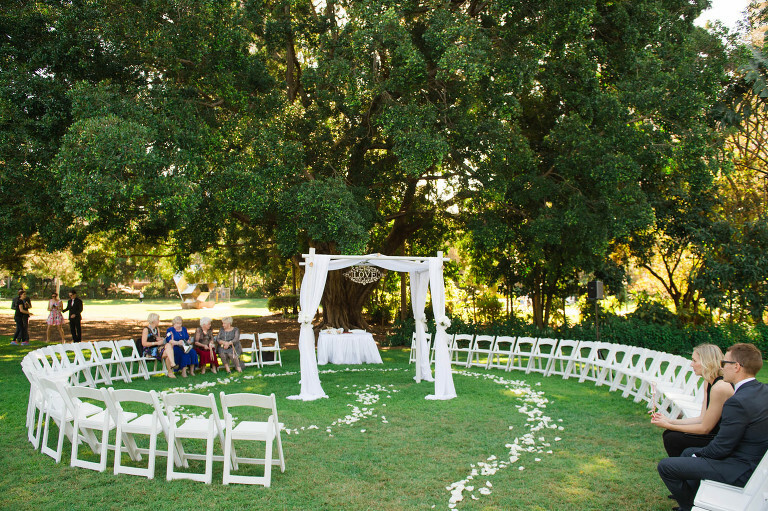 There are two grassed areas that are most often used for wedding ceremonies. 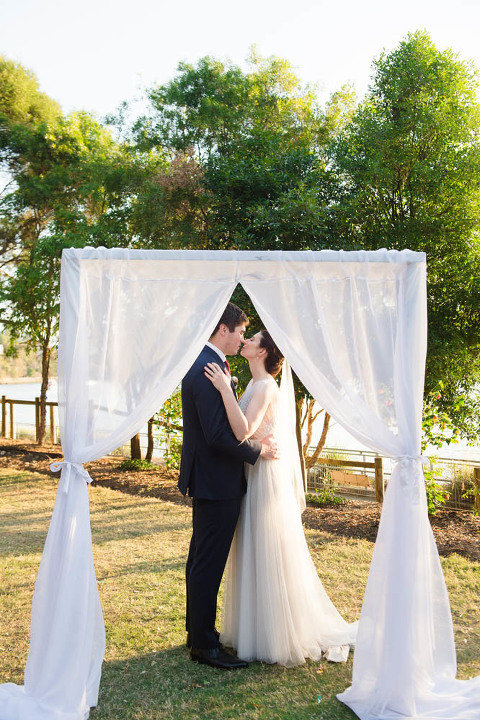 Both areas have awesome river backgrounds that look fantastic in photos. 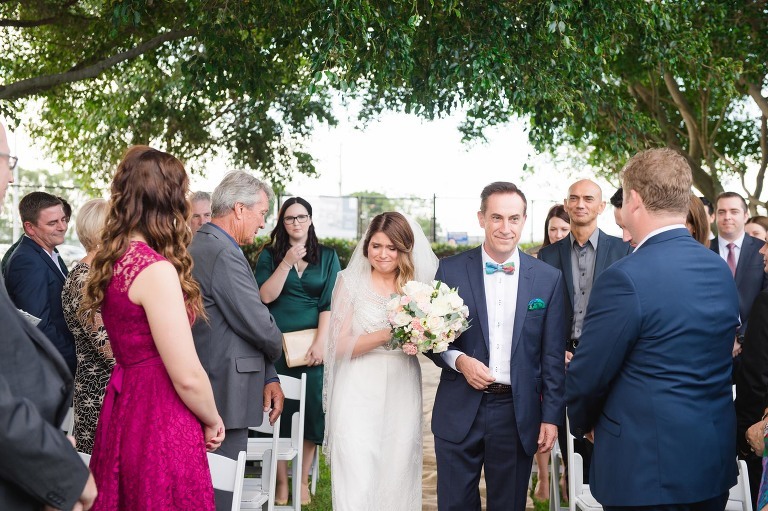 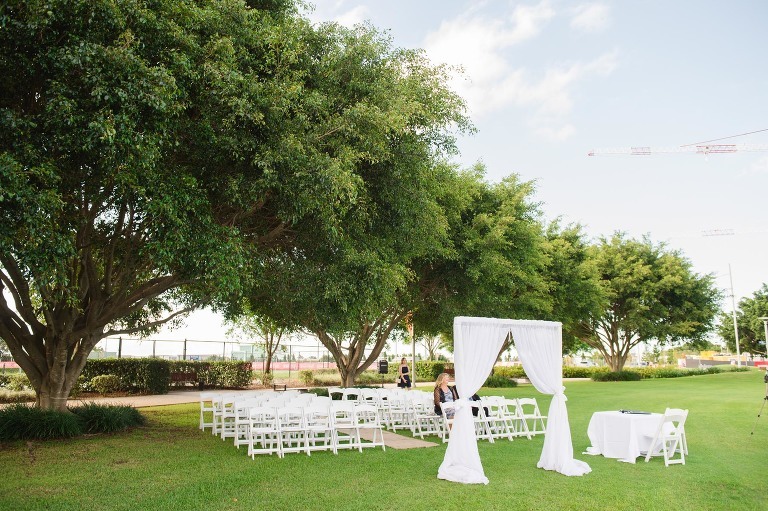 Northshore also has the added bonus of having a cafe and function area onsite as well, so you can have your wedding ceremony and reception all in the one beautiful waterfront location. 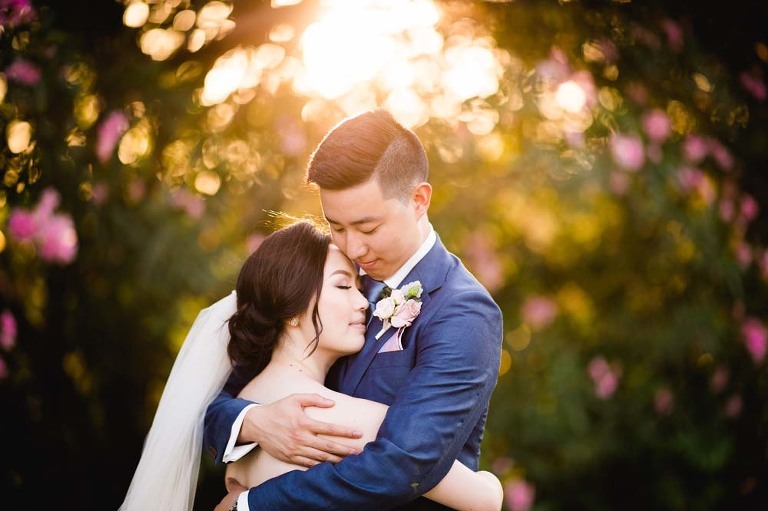 In fact, there are lots of photographic opportunities in the park and nearby surrounds, that you do not even have to leave the area the whole day. 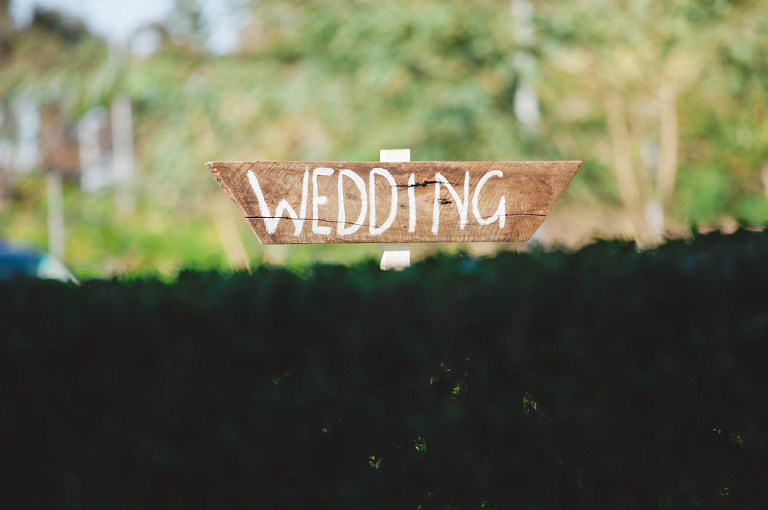 Which means more time with your guests enjoying yourselves and less time travelling around from location to location. 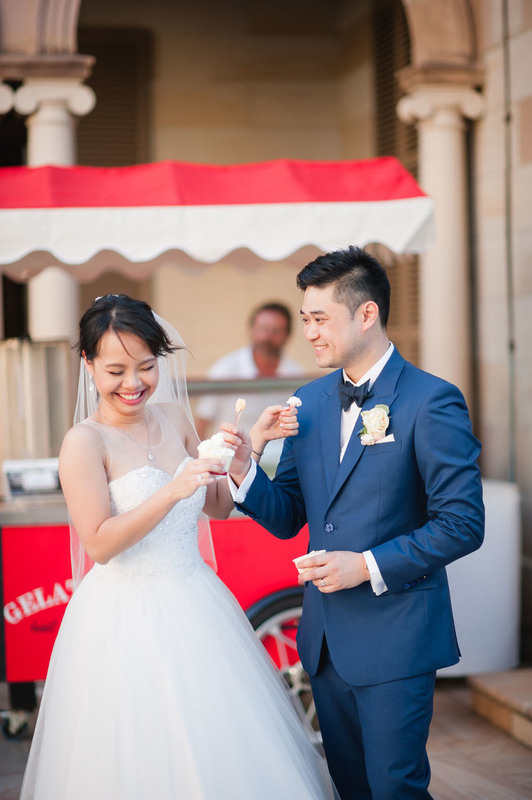 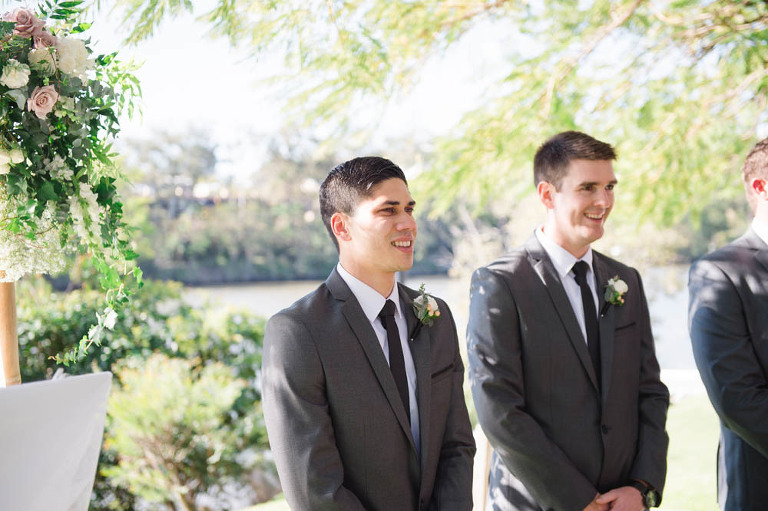 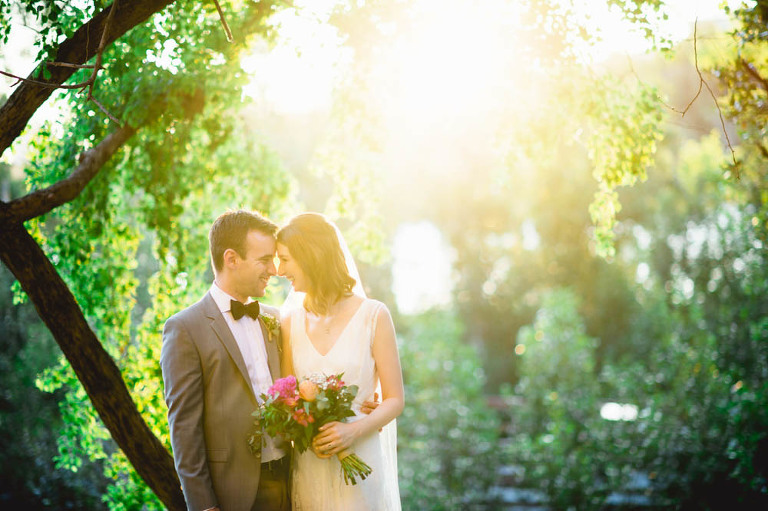 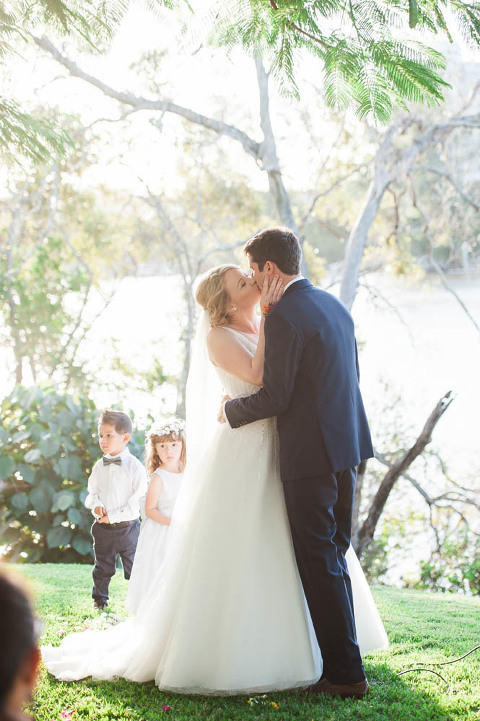 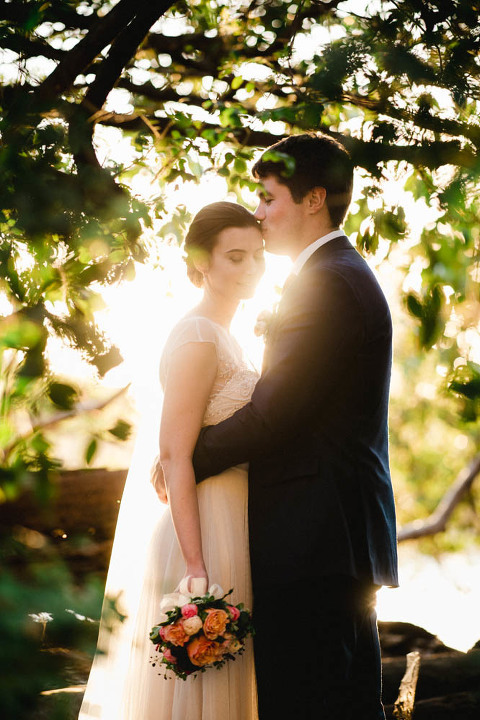 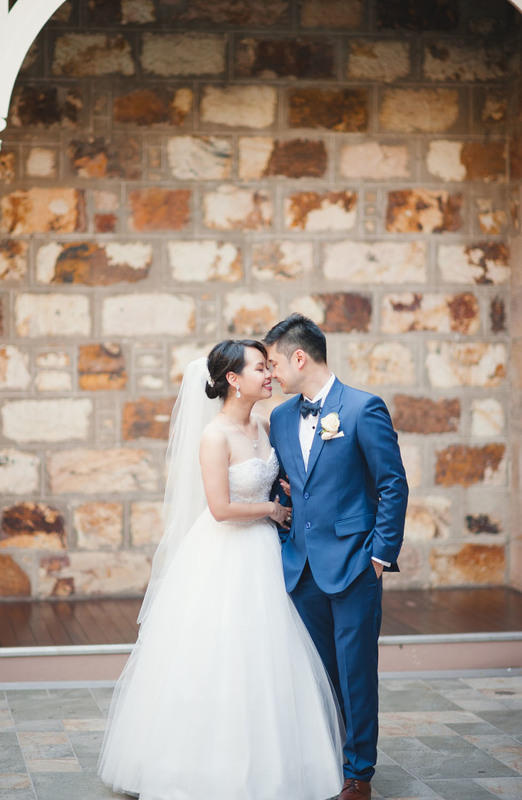 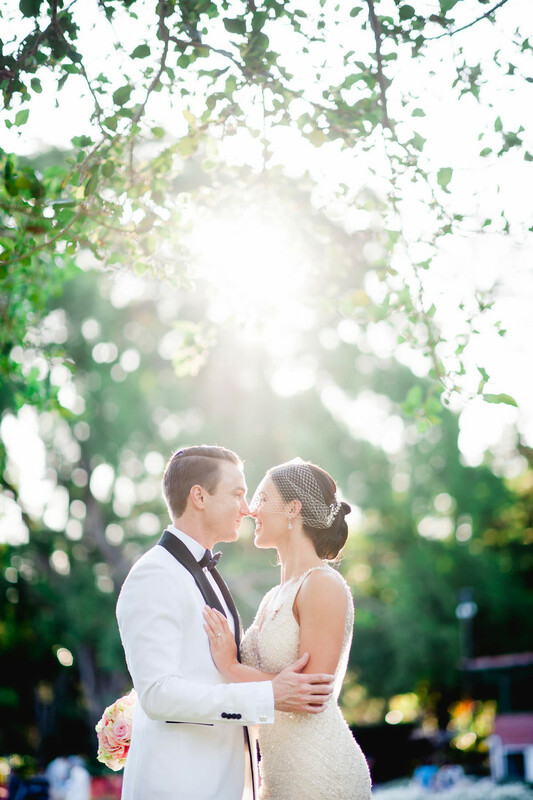 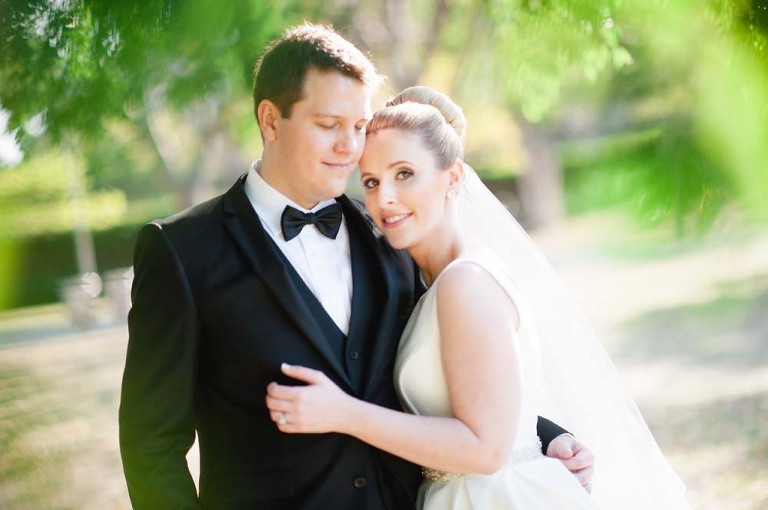 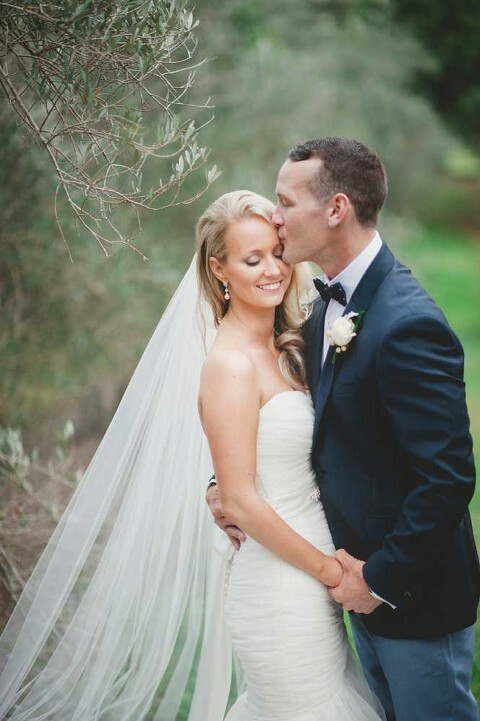 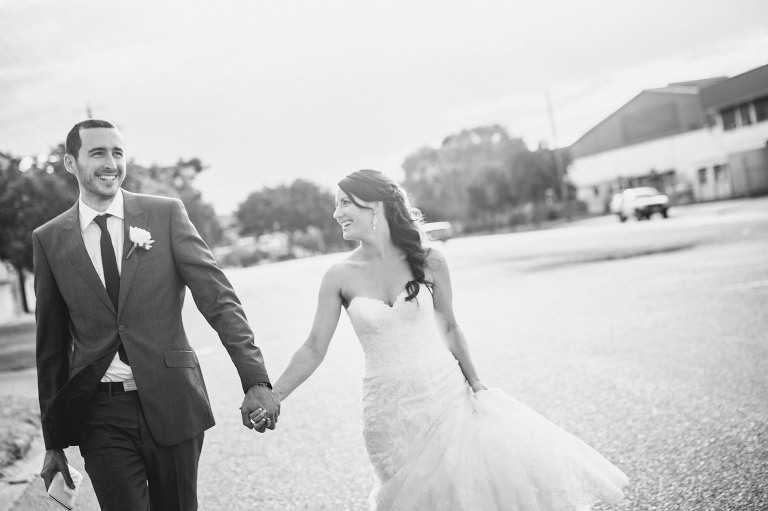 Riverlife is one of my favourite places for a relaxed and casual outdoor wedding. 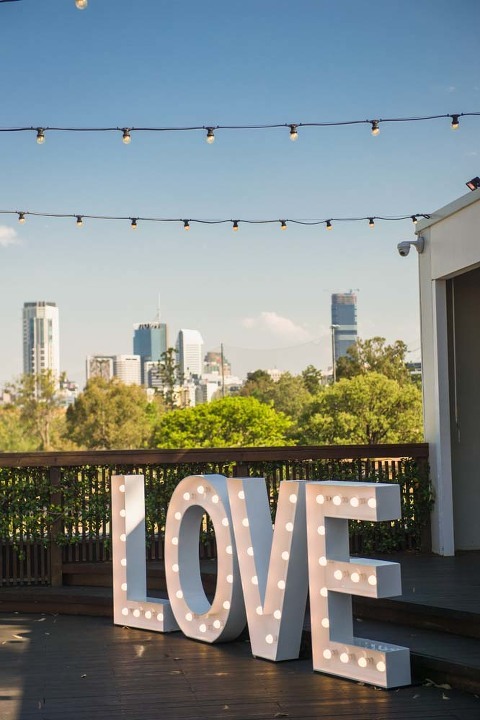 Situated at the base of Kangaroo point, and right on the river, Riverlife manages to create a lovely ‘ away from the city’ feel even though it is literally a 1 minute ferry ride from the city centre. 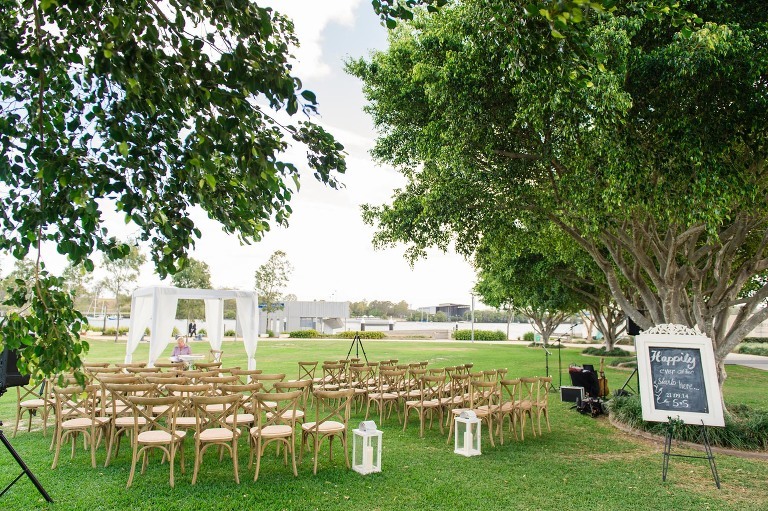 Ceremonies are held in one of two lawns which have sweeping views of the river and the Brisbane skyline. 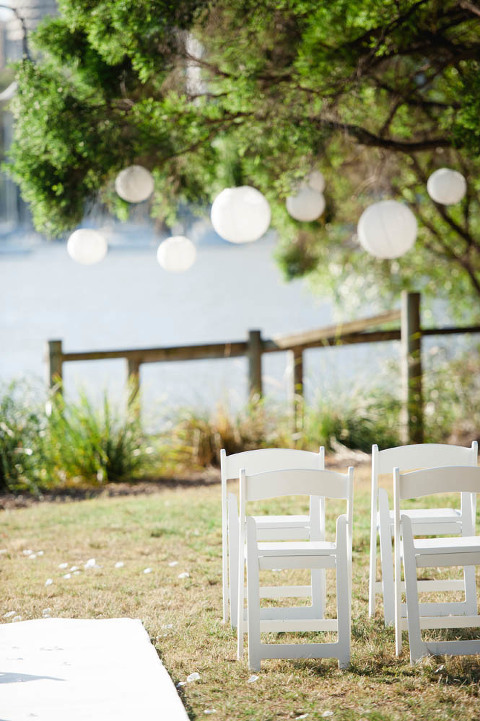 And nothing says relaxed than post ceremony drinks for your guests right on the river watching the afternoon go by. 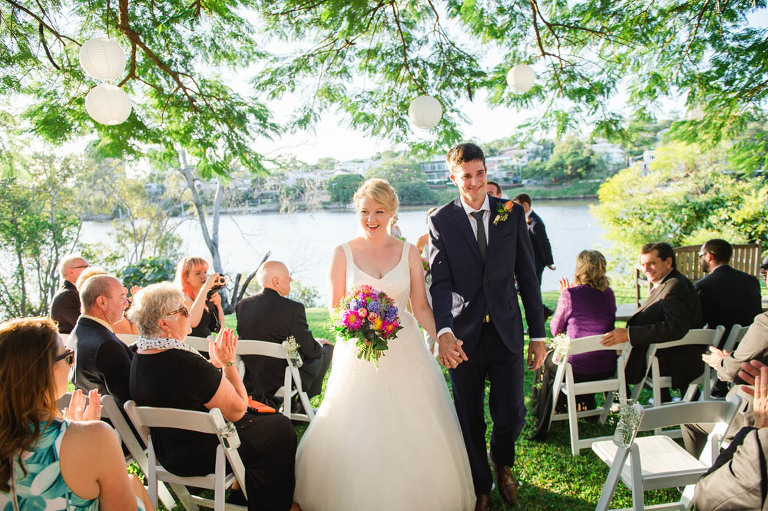 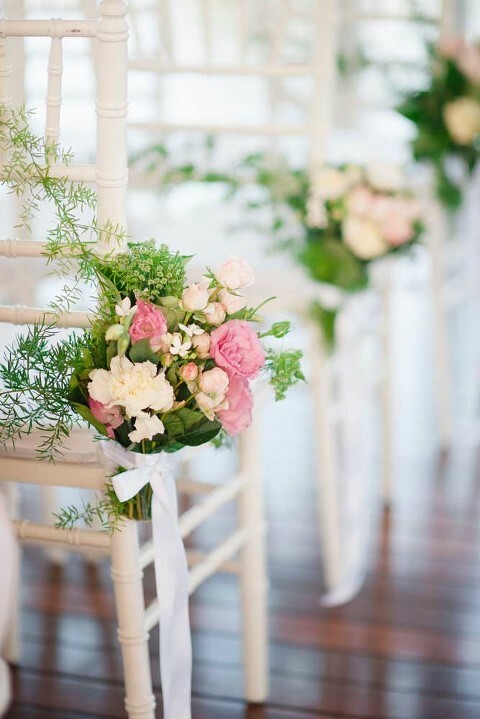 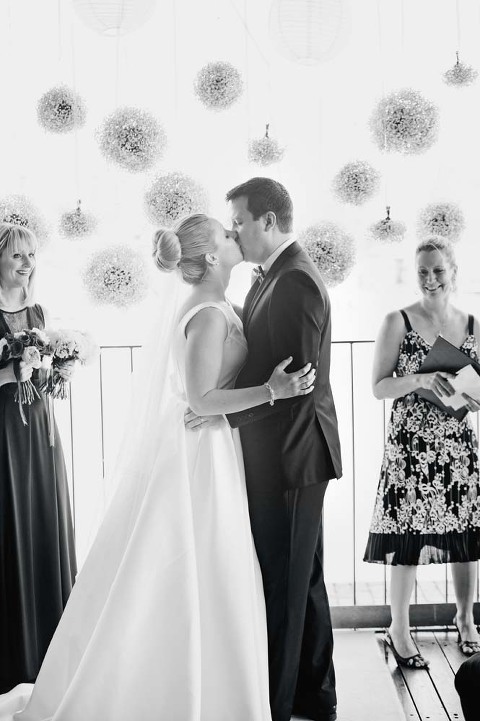 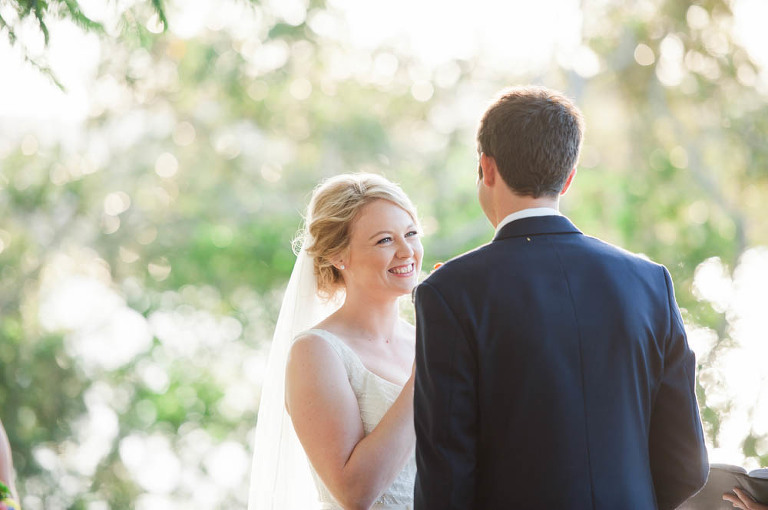 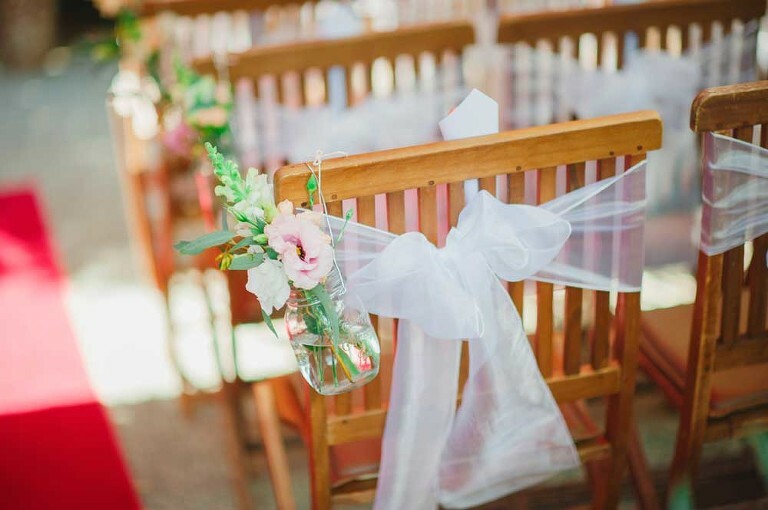 Toowong Rowing Club is a lovely garden wedding option on the west side of Brisbane. 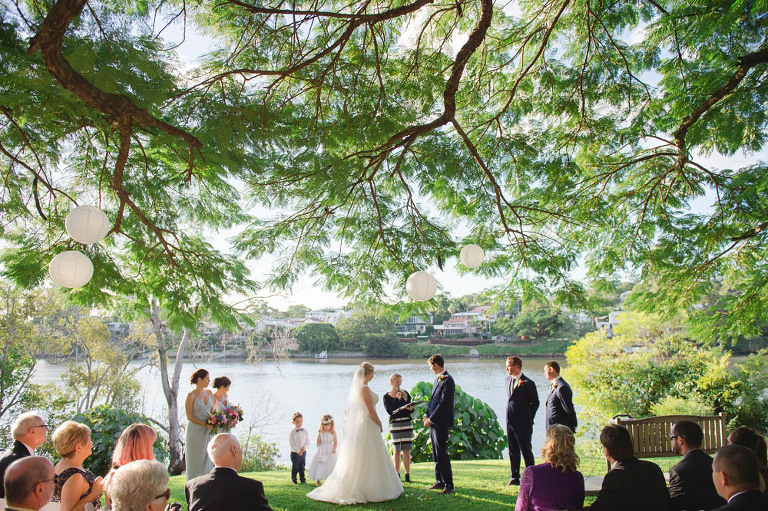 Ceremonies are held under a beautiful shady poinciana tree with the Brisbane river behind. 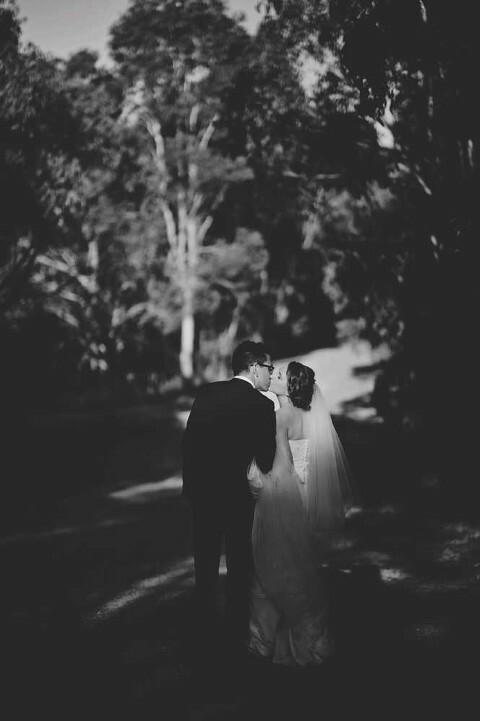 Being on a quiet bend in the river in the suburb of St Lucia provides a great relaxed feel to weddings held there. 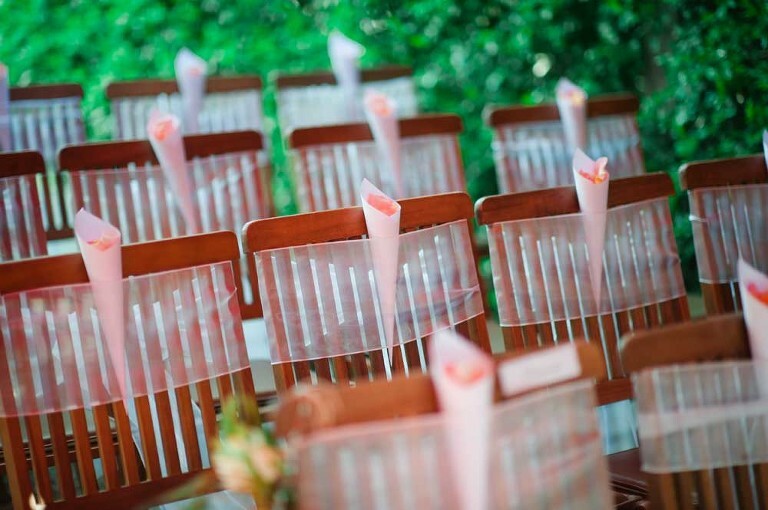 The club also has reception hosting options for those who want to keep everything nice and local. 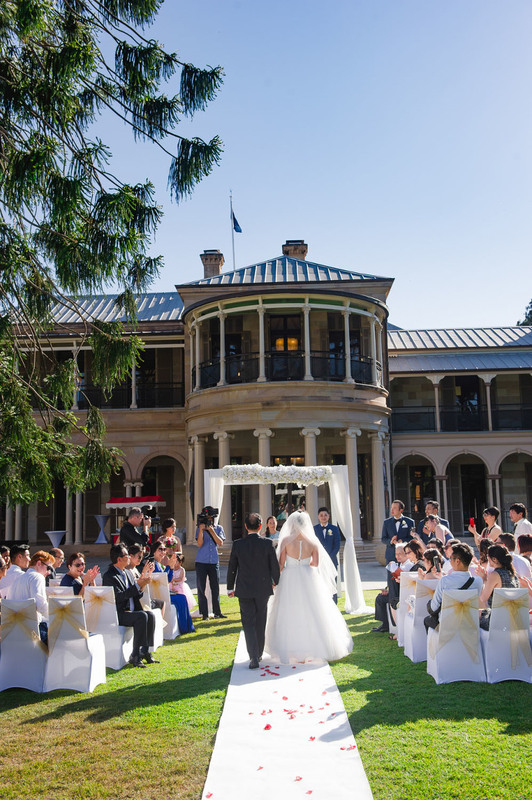 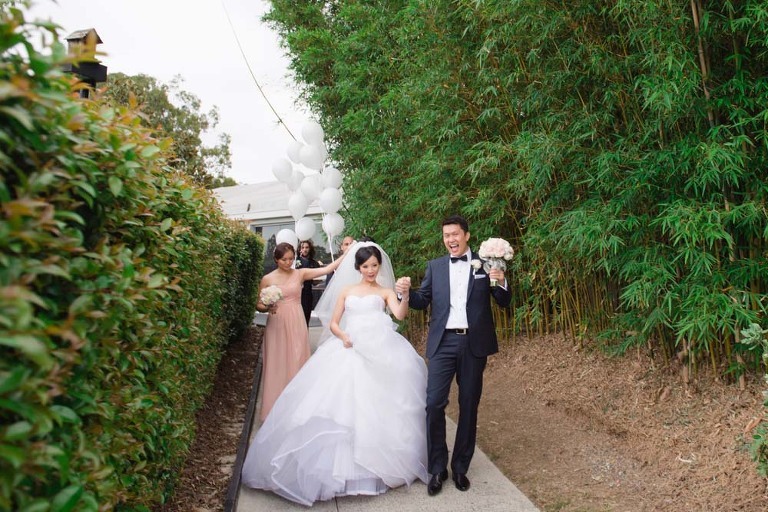 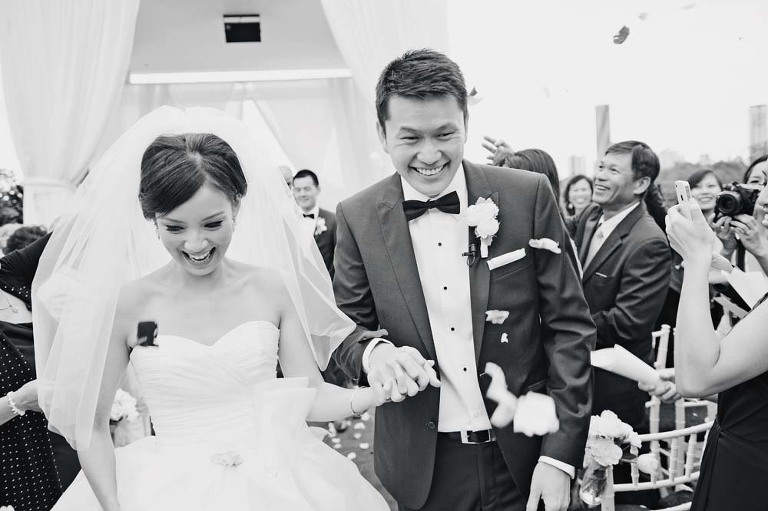 Victoria Park Function Centre is an inner city wedding ceremony and reception venue. 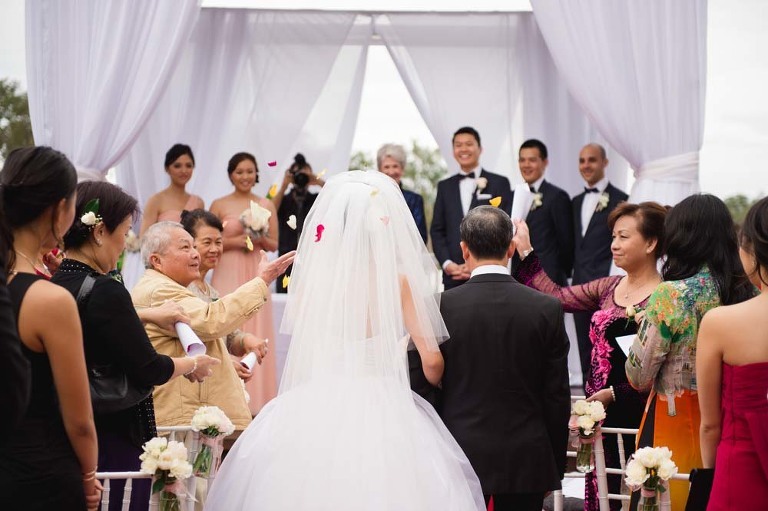 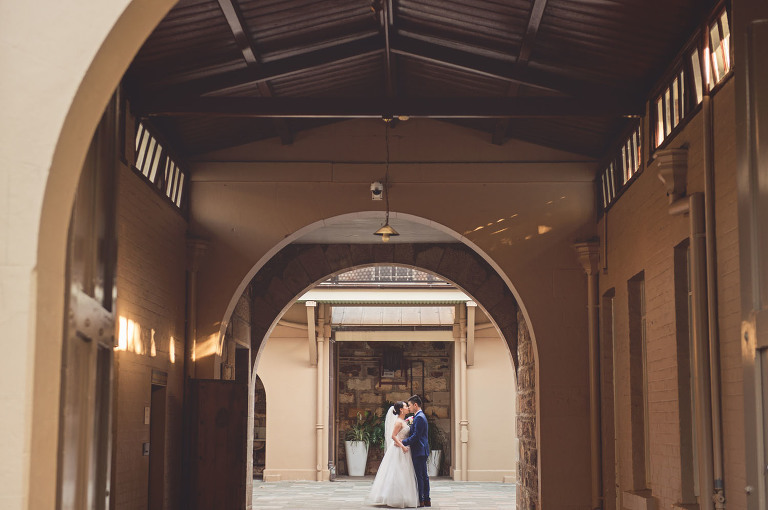 Most known for their elegant function and reception rooms. 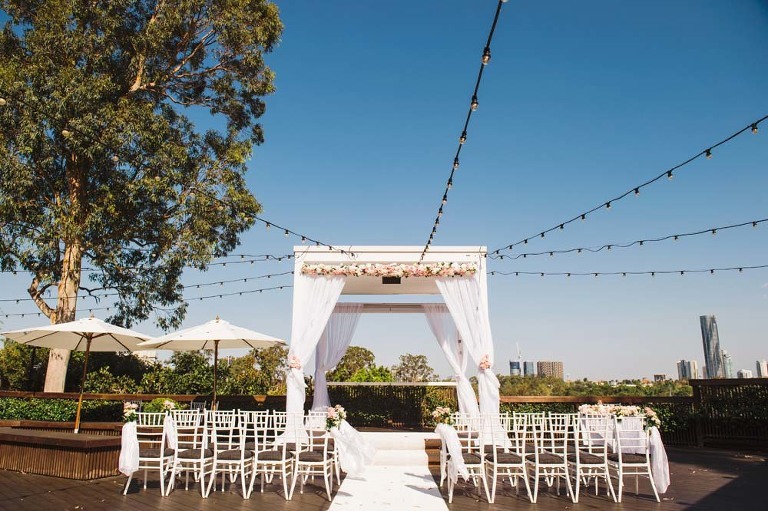 But they also have a number of outdoor ceremony options. 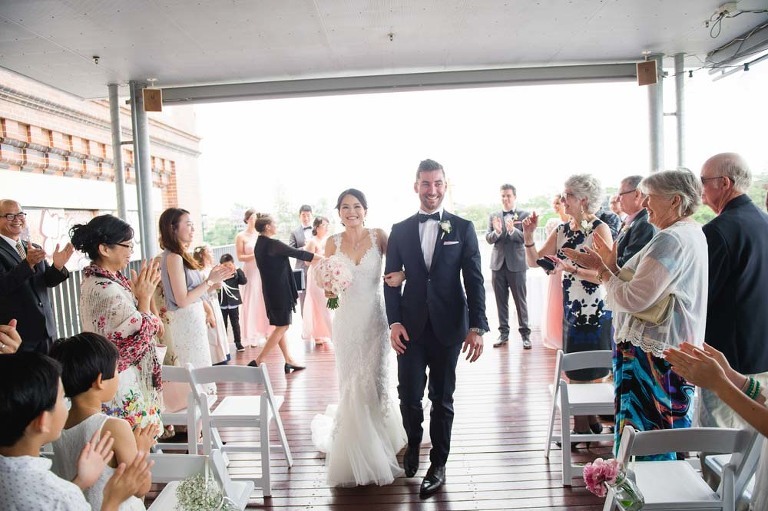 The most popular being on the deck of the Grand Marque. 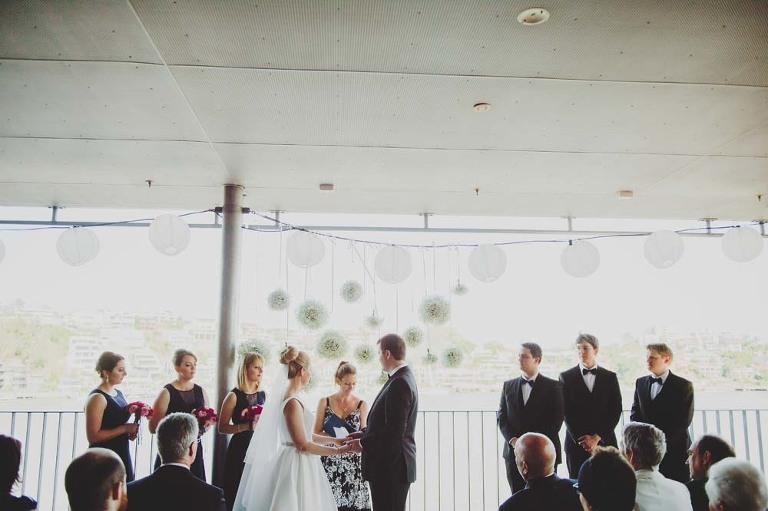 Overlooking the Brisbane skyline, the deck is the perfect backdrop for a relaxed wedding ceremony. 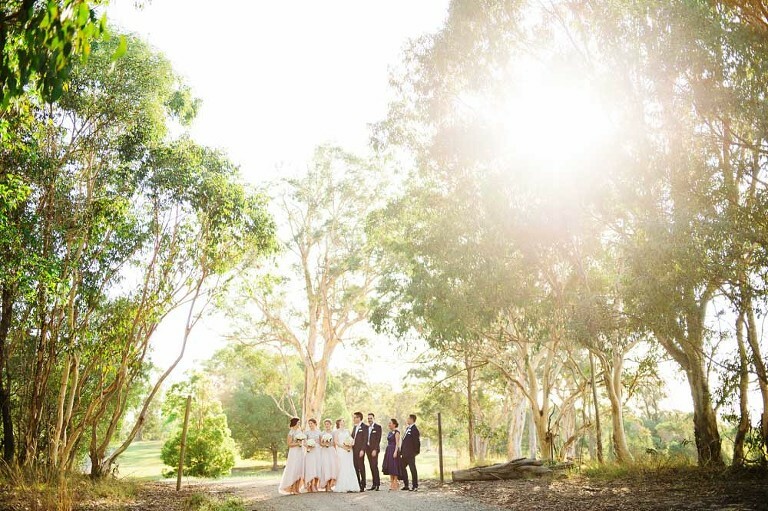 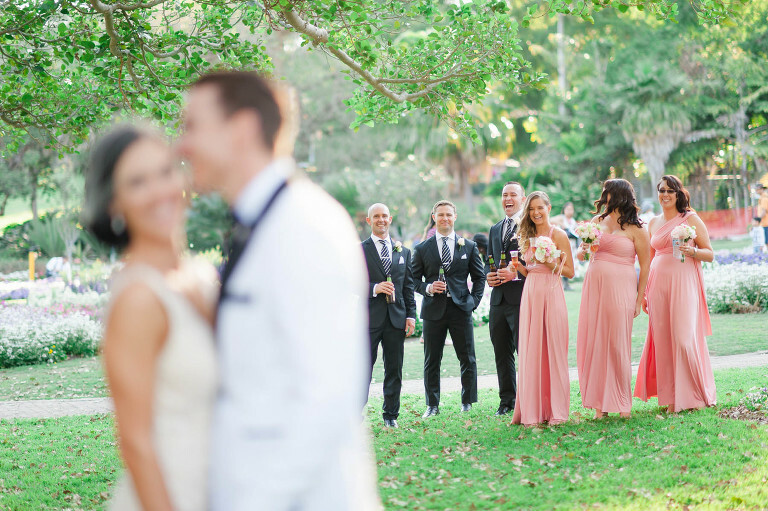 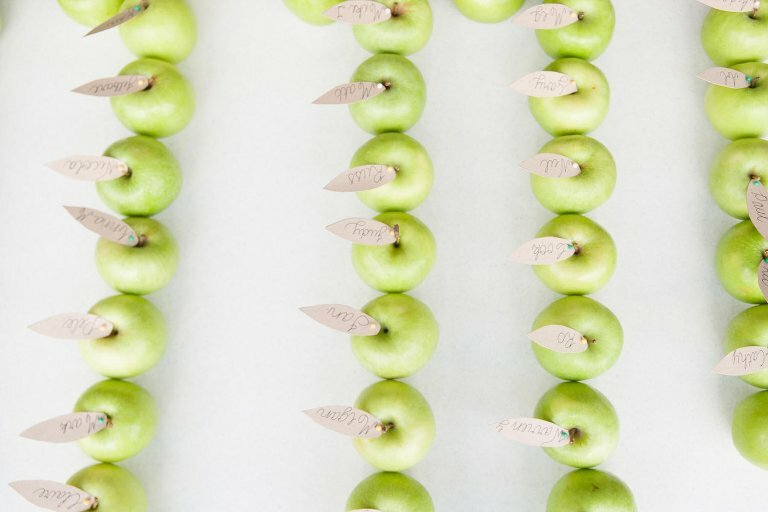 The rolling green tree-lined course also makes the perfect bridal party photo location following the ceremony. 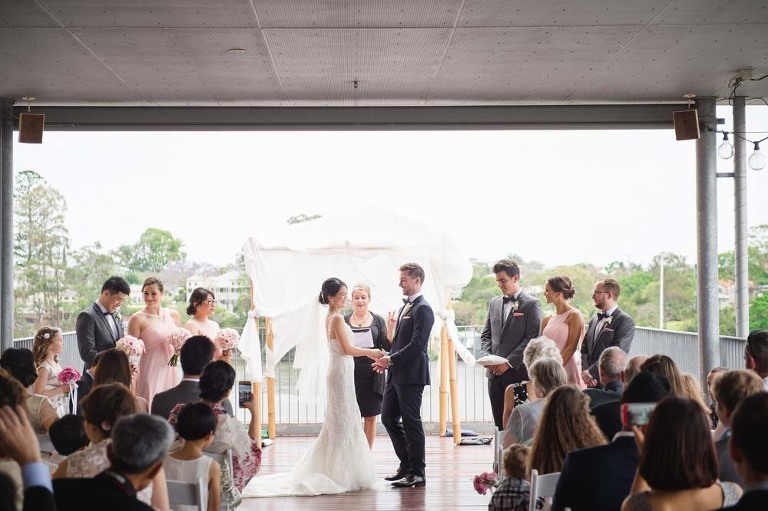 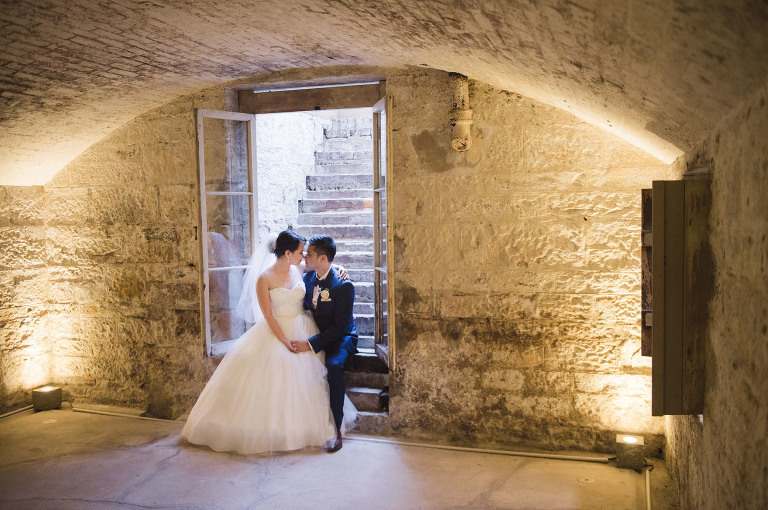 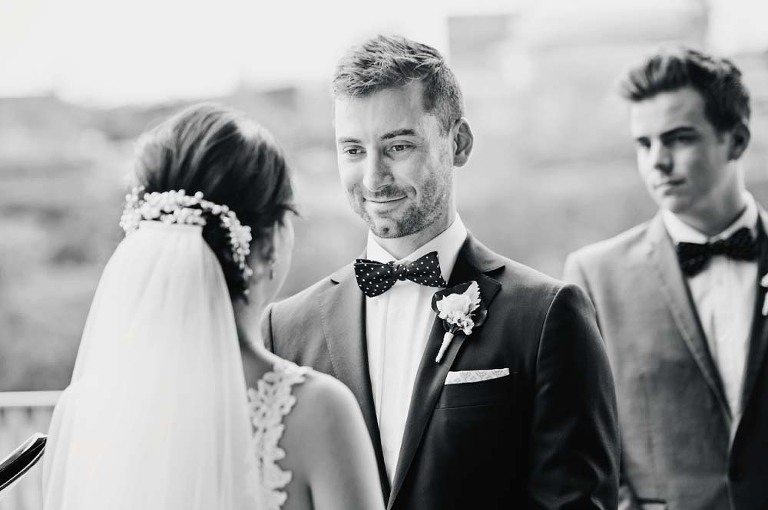 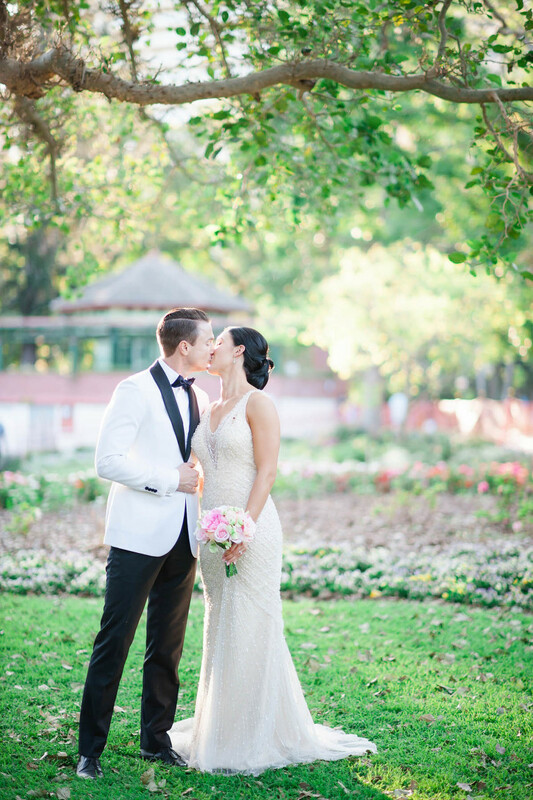 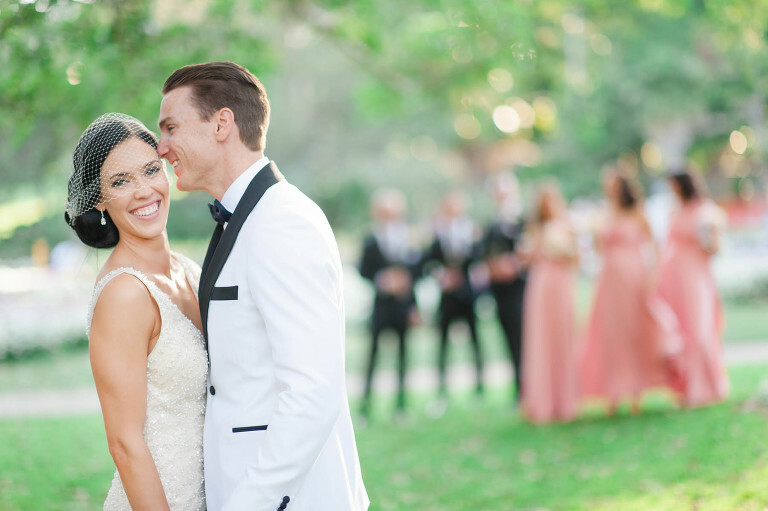 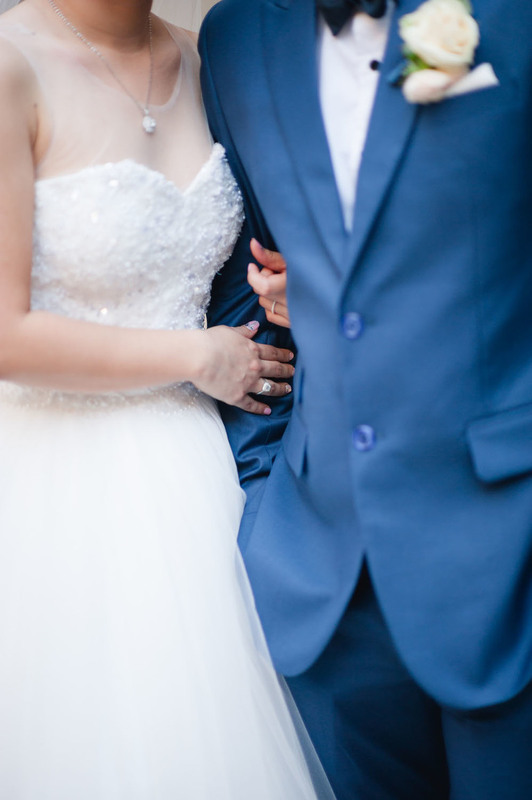 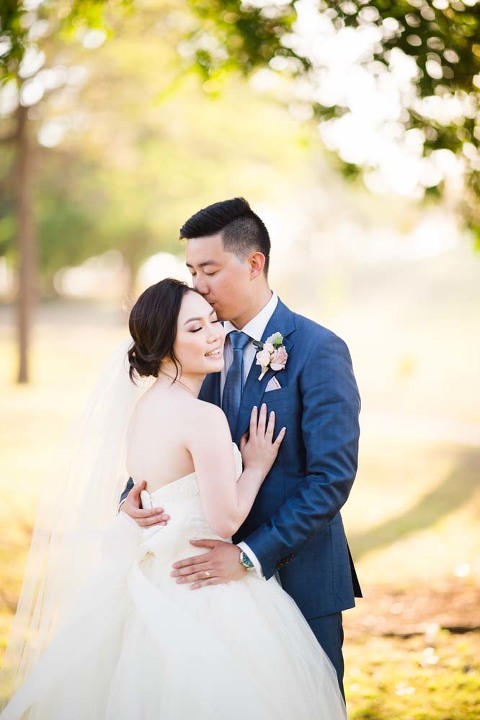 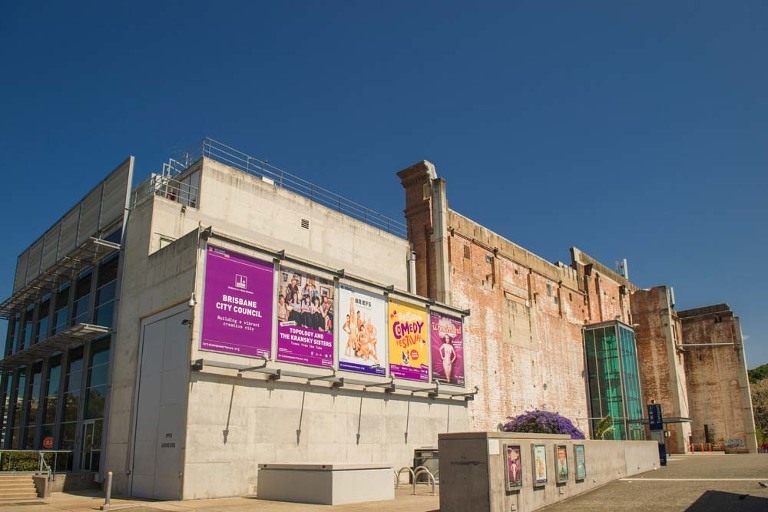 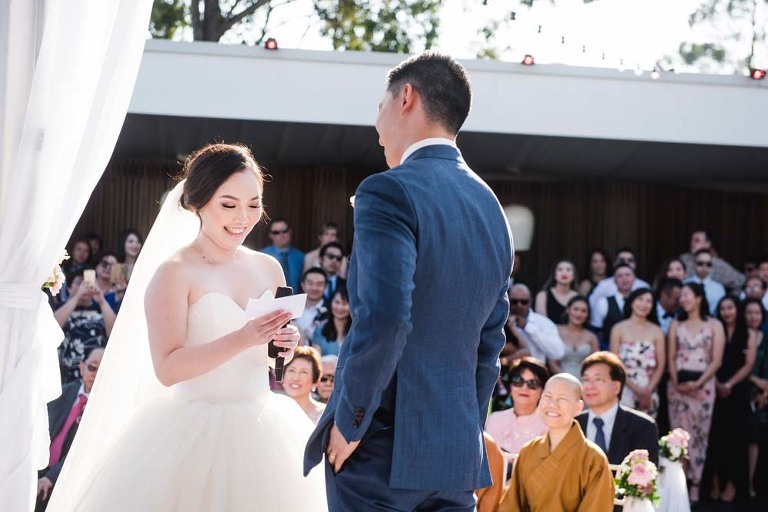 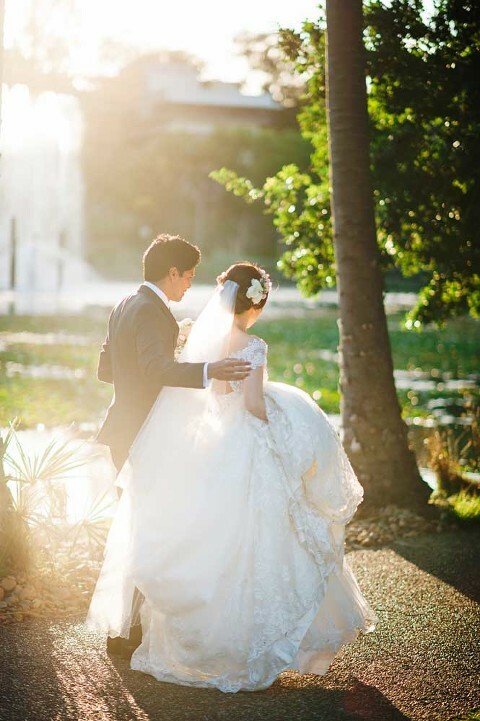 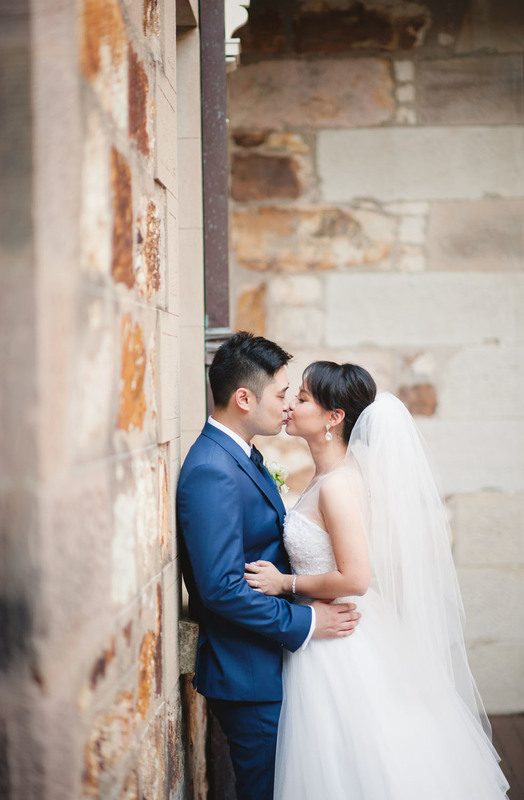 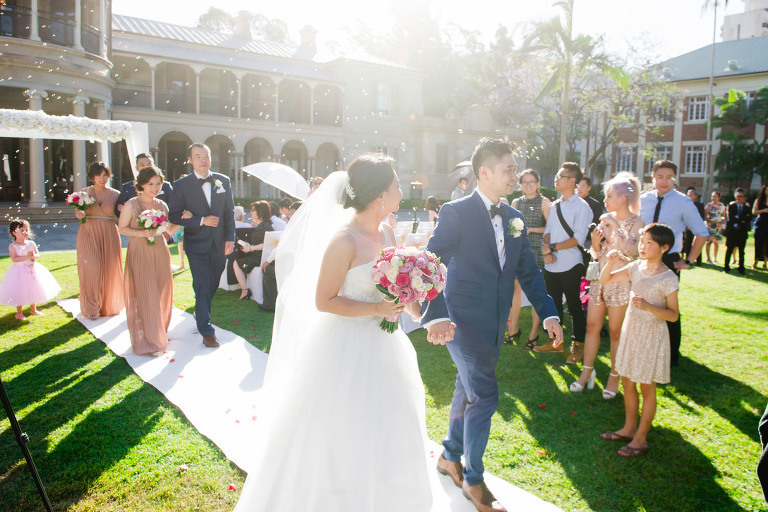 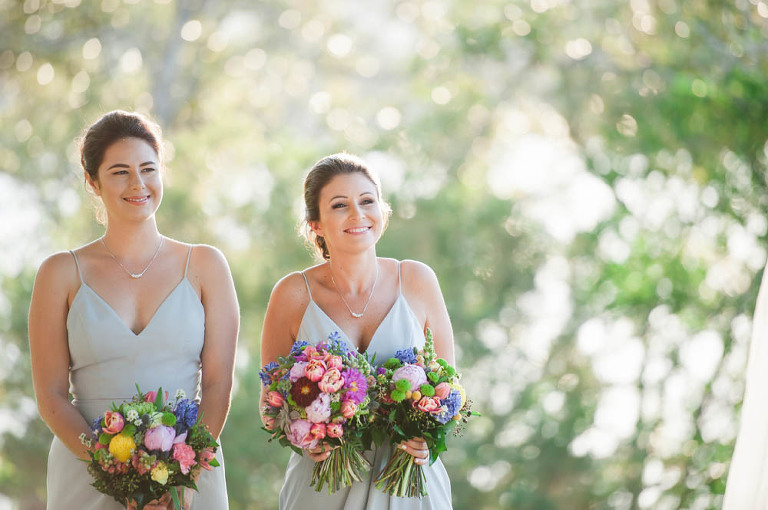 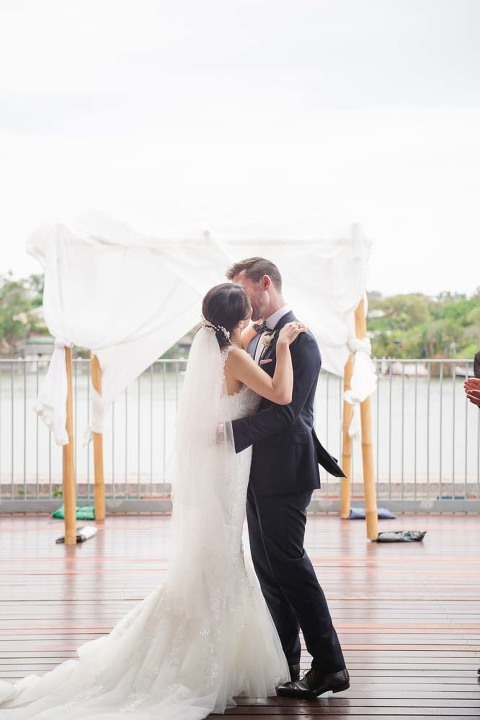 Located right on the river in the leafy suburb of New Farm, New Farm Park and the Brisbane Powerhouse has become one of the most loved wedding spot in the city. 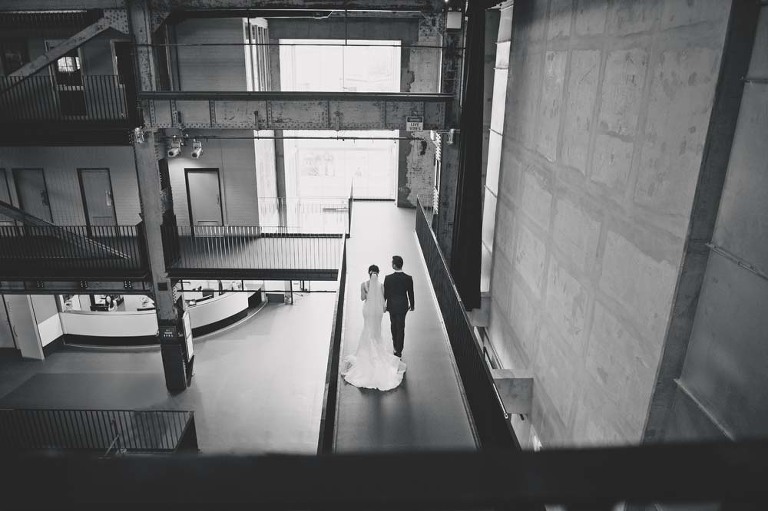 Many couples are drawn to the funky industrial exterior of the former power station. 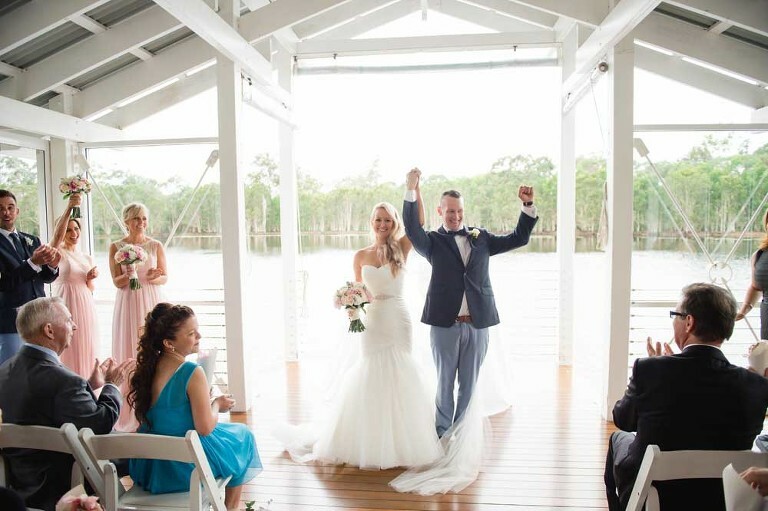 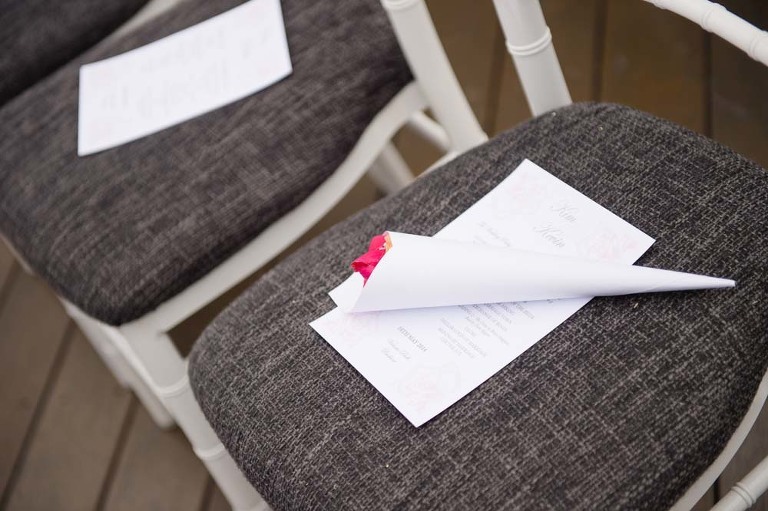 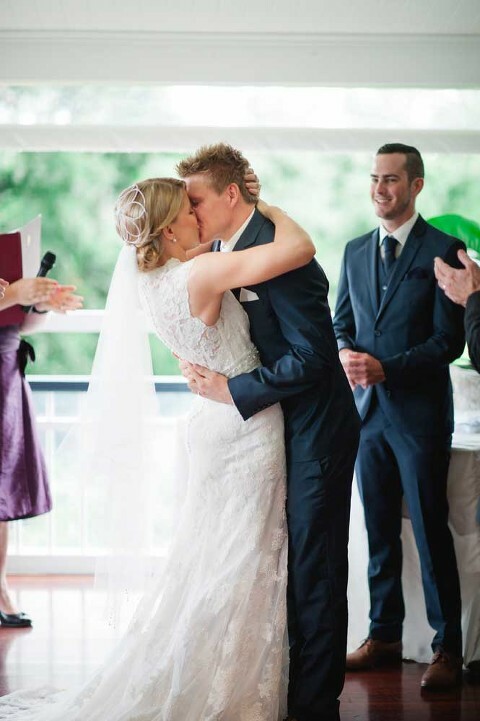 Others love the views out onto the river from the riverside decks which are perfect for small intimate ceremonies with close friends and family. 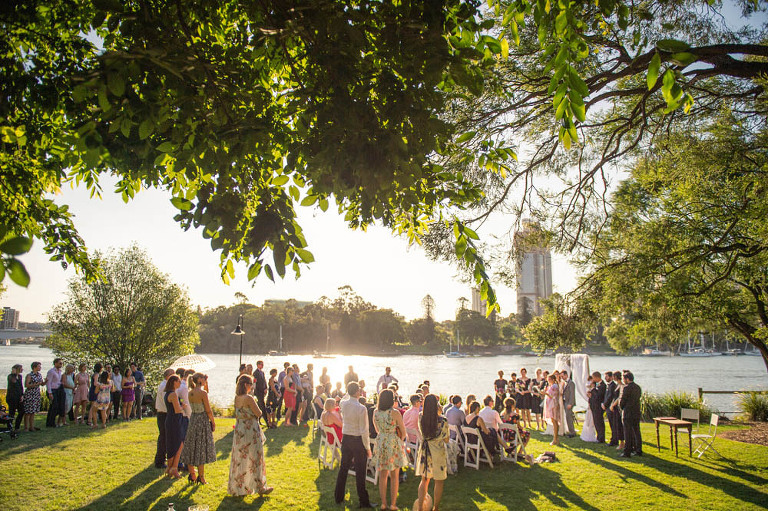 New Farm Park, just next door, is also an option for a more outdoor garden wedding style of ceremony. 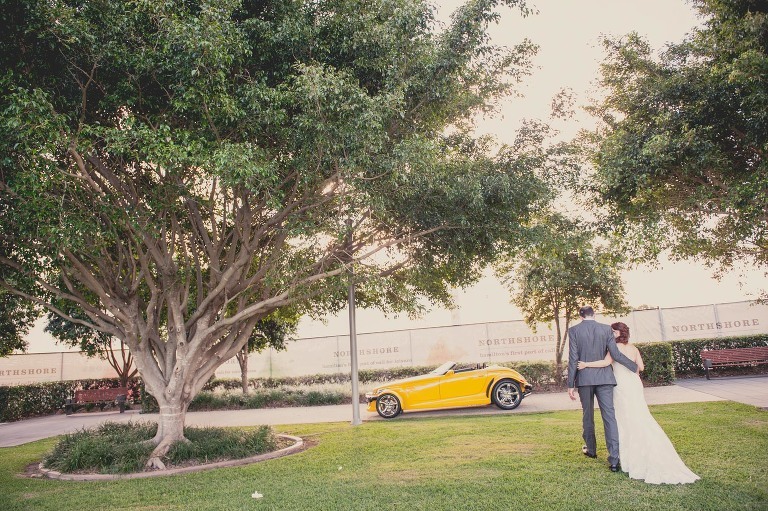 Location photos after the wedding is a breeze here, with the combination of the industrial style architecture and manicured gardens and massive fig trees a great combination. 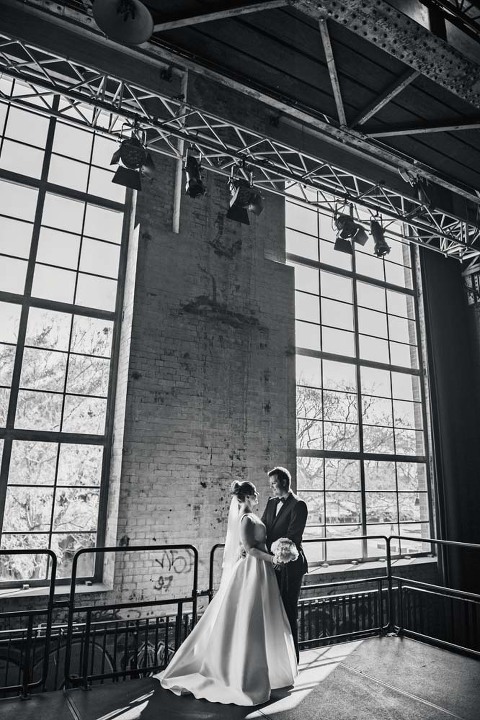 The Powerhouse also incorporates two restaurants for those who want to have their wedding reception also within the funky industrial area. 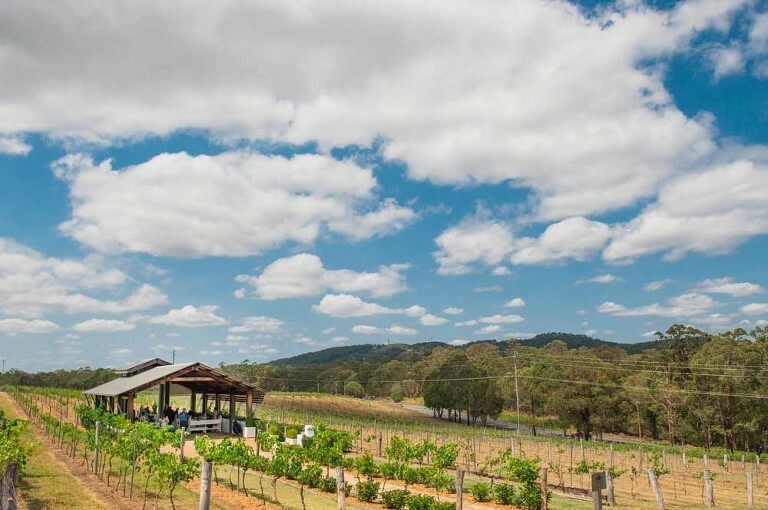 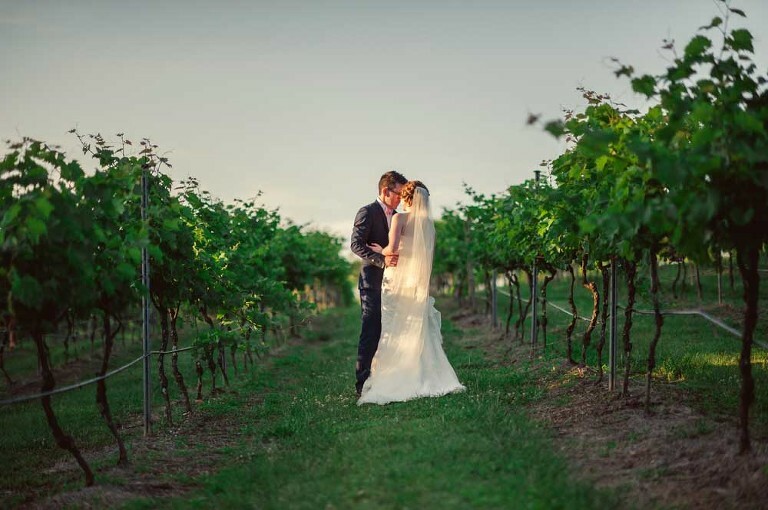 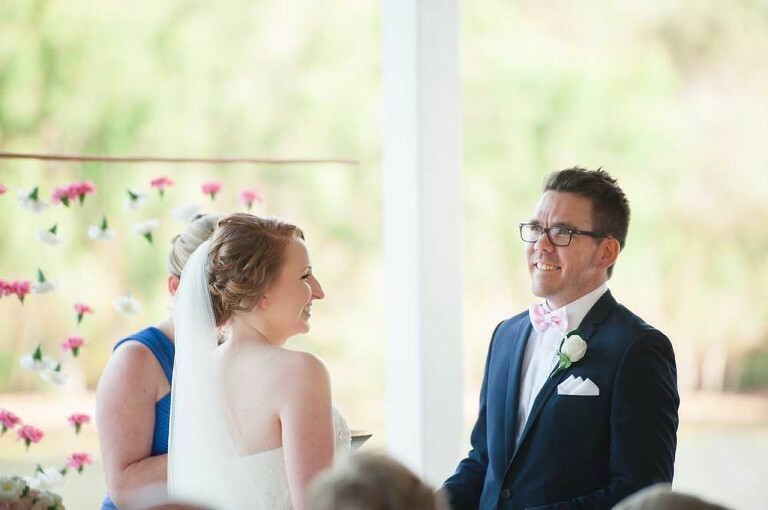 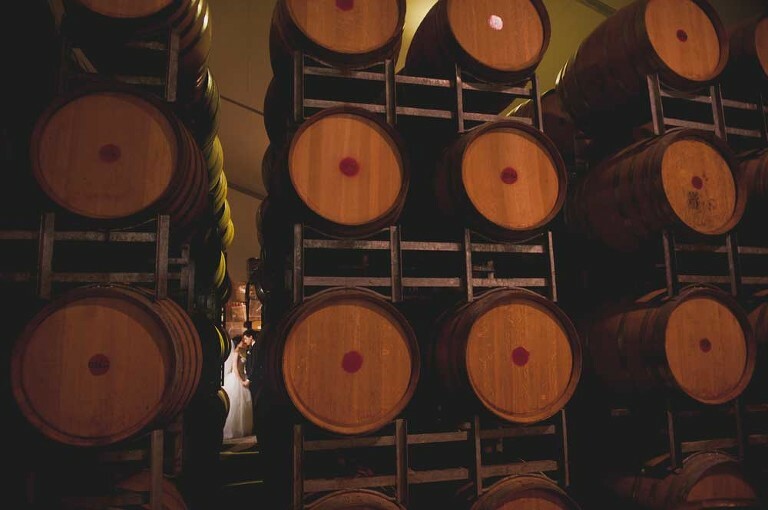 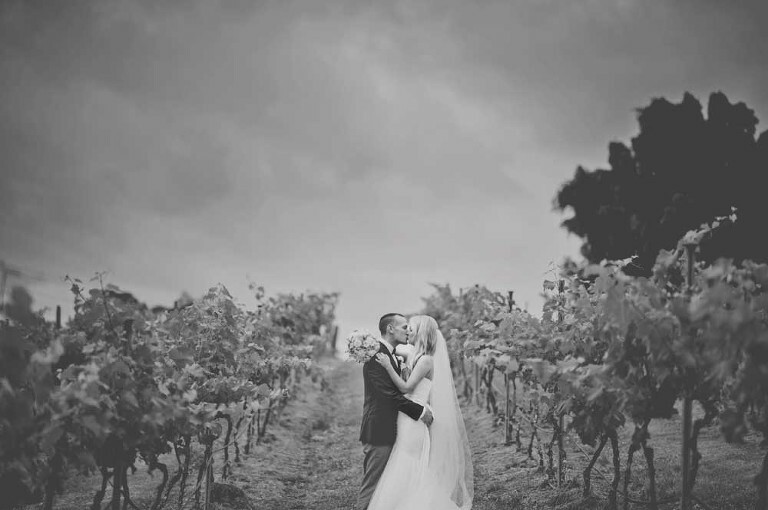 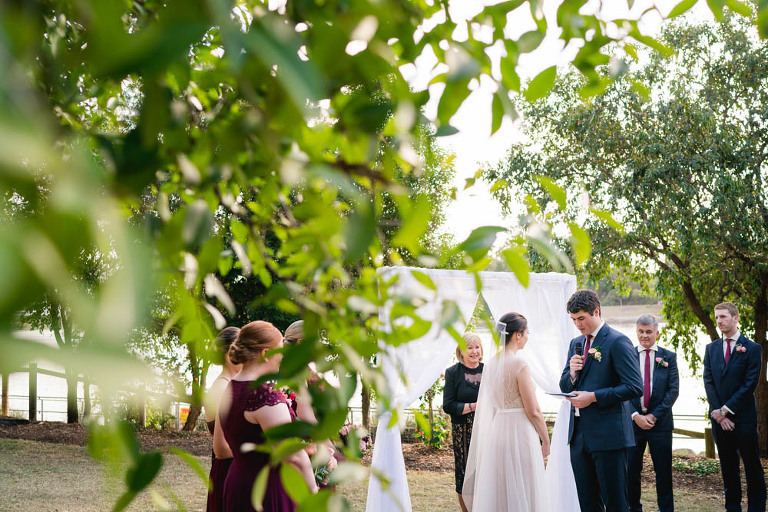 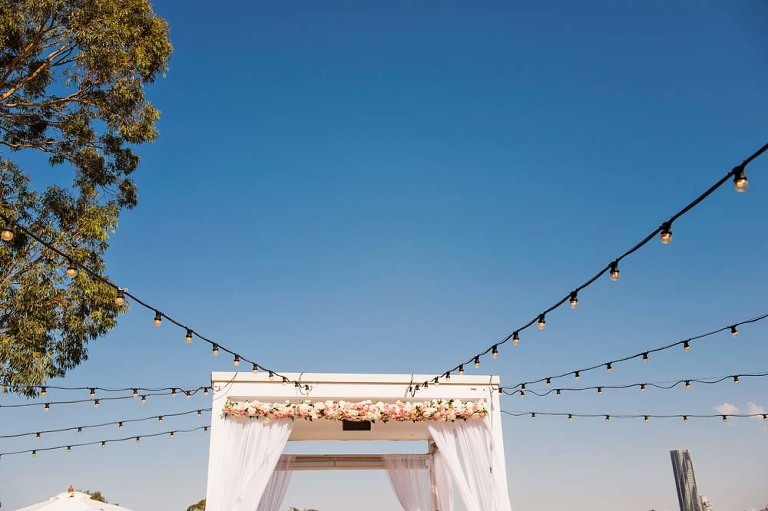 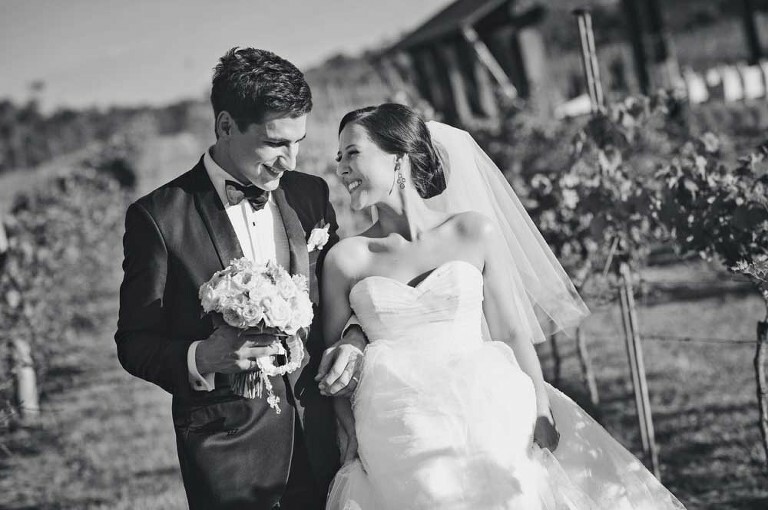 If you are willing to travel a little bit out of Brisbane city for your ceremony, Sirromet Winery at Mt Cotton should be on your short list of ceremony and reception venues. 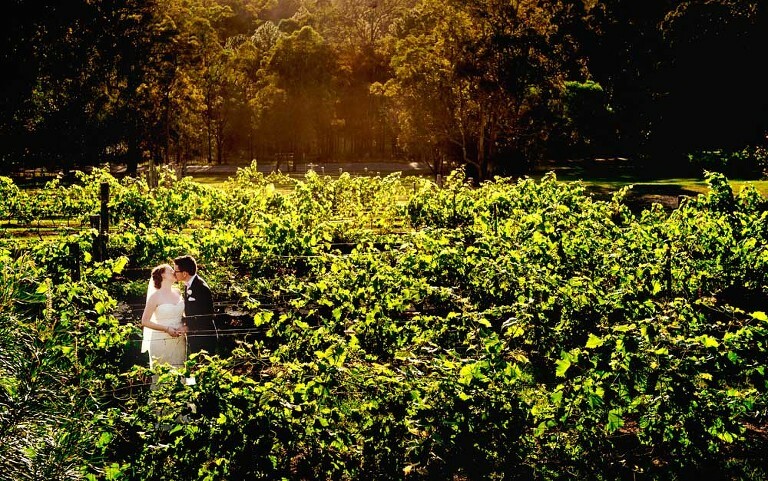 Set in the country backdrop of Mt Cotton, Sirromet offers that much sort after country / natural feel that many people love. 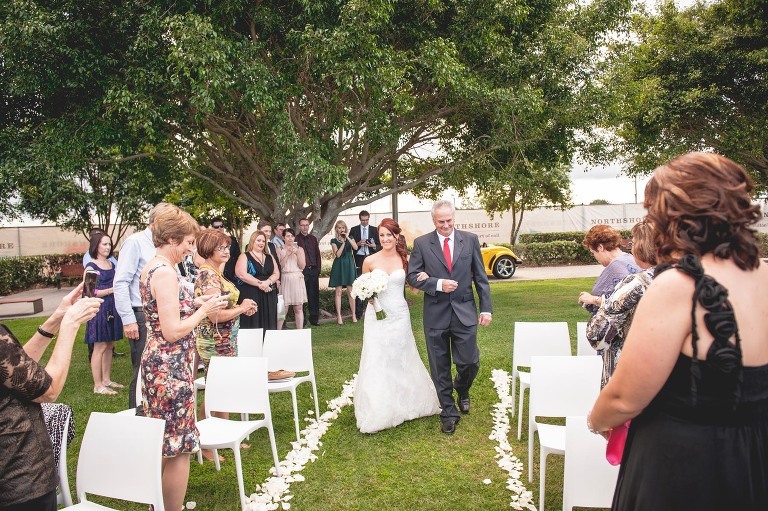 For ceremony options at Sirromet, couples can choose between the Laguna and the Arbour. 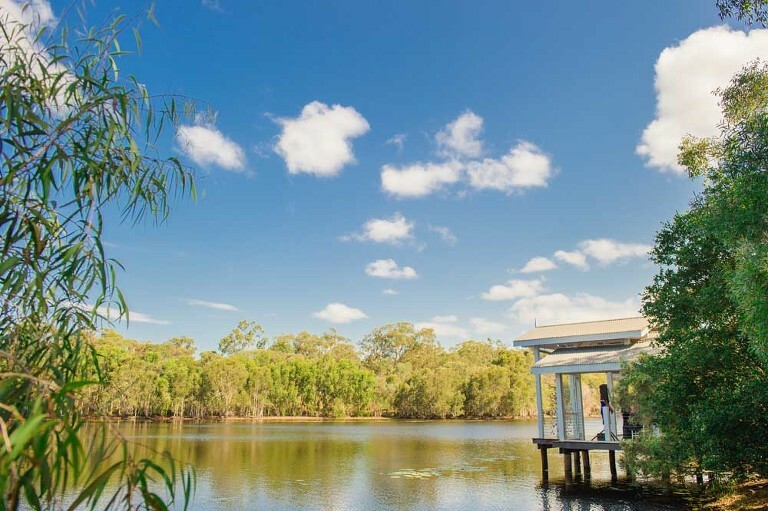 The Laguna overlooks a natural lagoon and is surrounded by bushland while the Arbour is right amongst the vineyard iself. 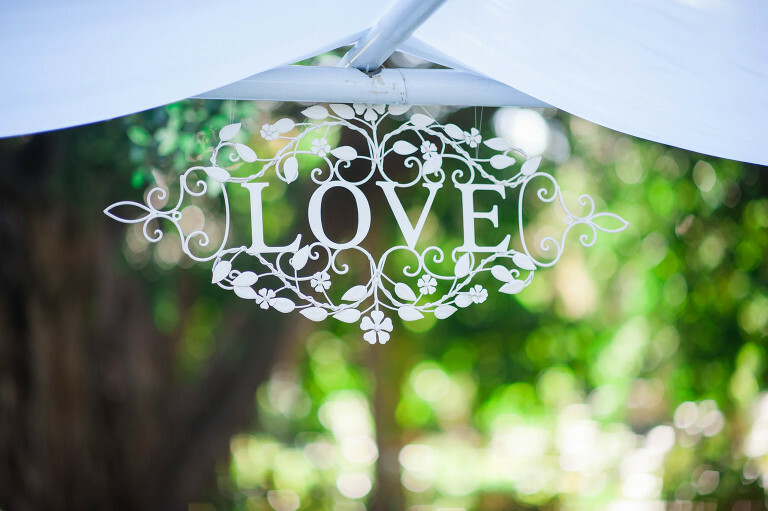 Both offer compelling benefits and views. 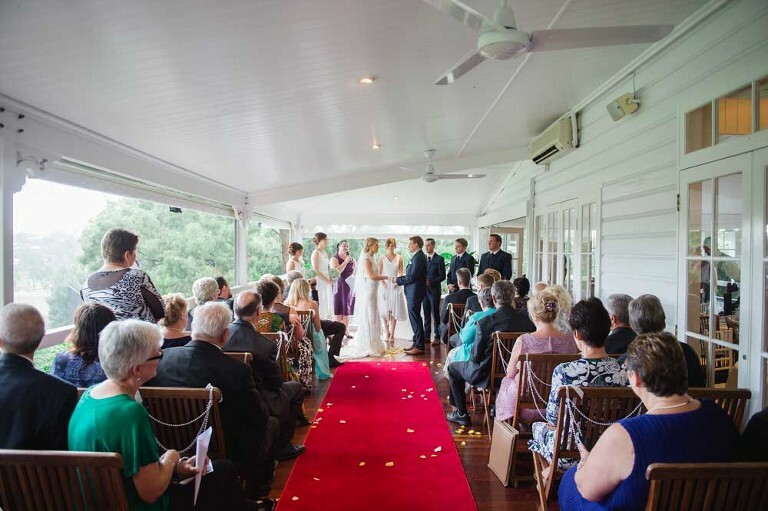 Hillstone St Lucia has made a name for itself over the years as a great wedding reception venue. 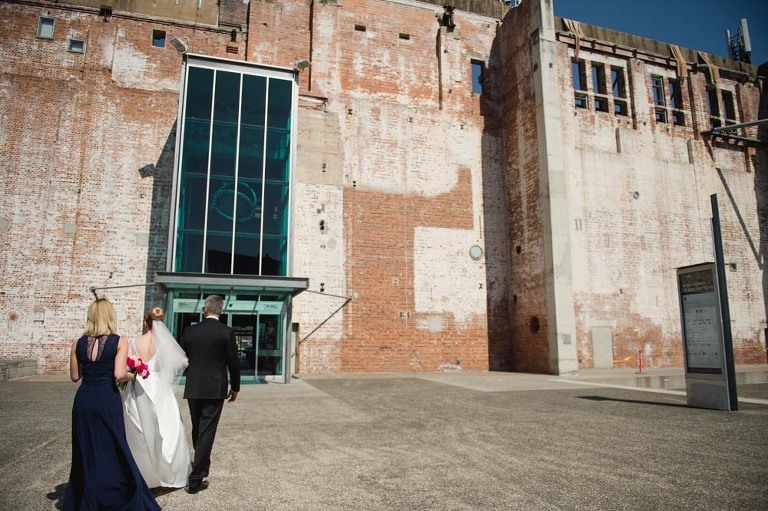 But some people may not realise that it is also a great ceremony location as well. 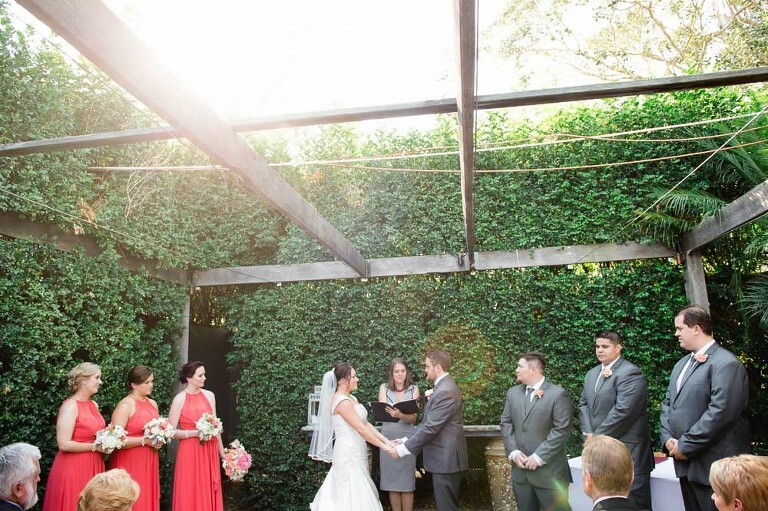 Hillstone has two excellent outdoor ceremony locations. 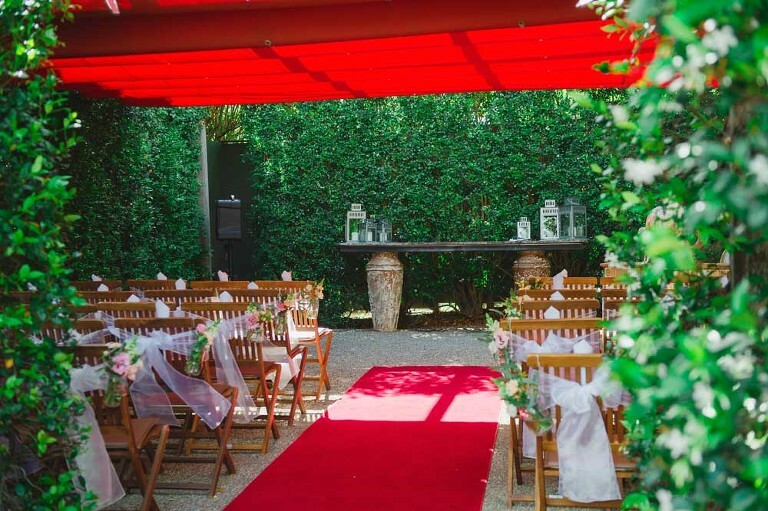 The Fountain area for smaller intimate ceremonies and the Courtyard Garden with its manicured hedges and shaded gazebo. 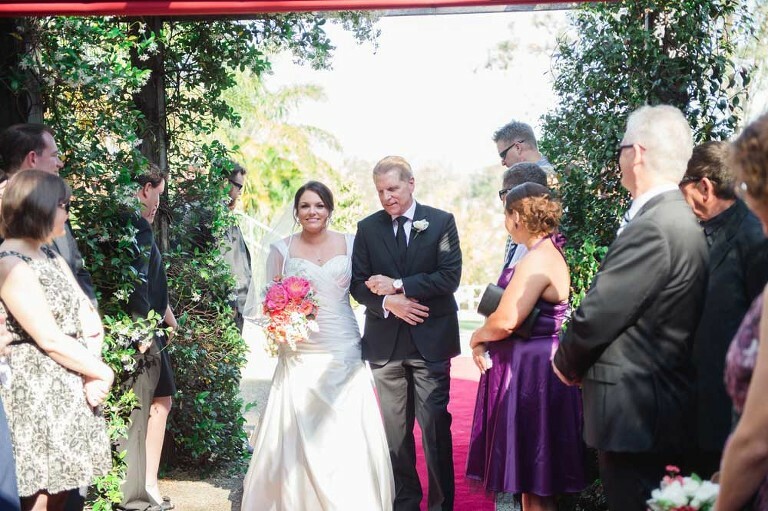 Regardless of which you chose, you know you are in good hands with the experienced and friendly staff. 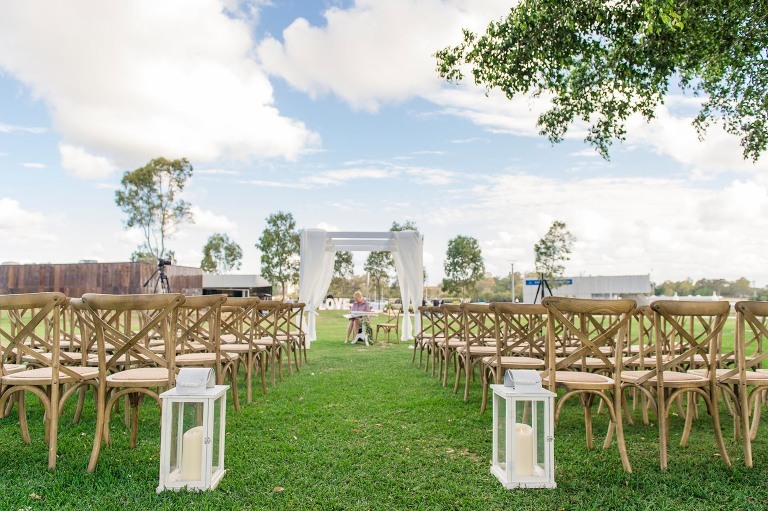 They really know how to look after your guests while you are out enjoying some photos on the picturesque course or at the nearby University of Qld St Lucia Campus.